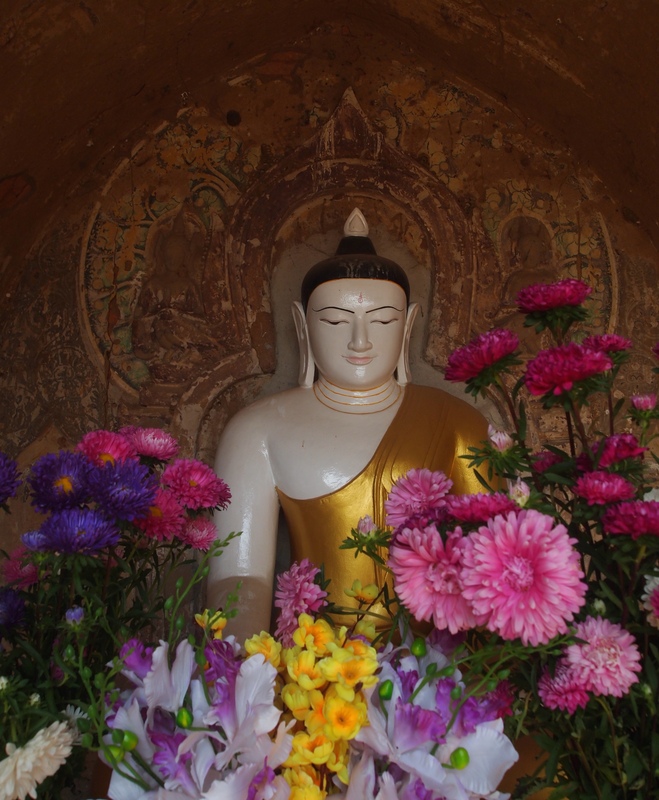 Friday, February 20: After I leave the “many elephants temple” with my Havaianas and my e-bike, I drop in again at Htilominlo Pahto to pick up a few more of the lightweight cotton pants I bought yesterday for $3 each. I can wear them as I continue my travels around the country. 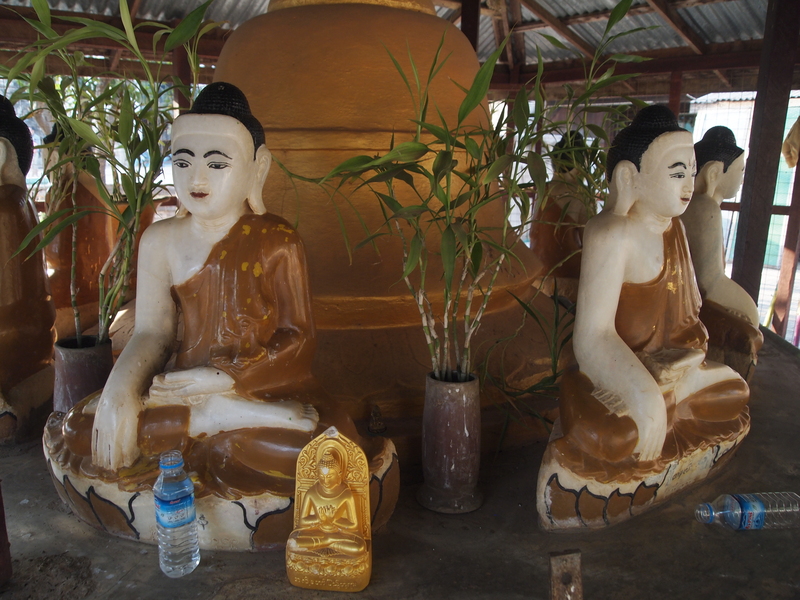 I put them on the handlebars of the e-bike and stop next at Ywa Haung Gyi Temple. 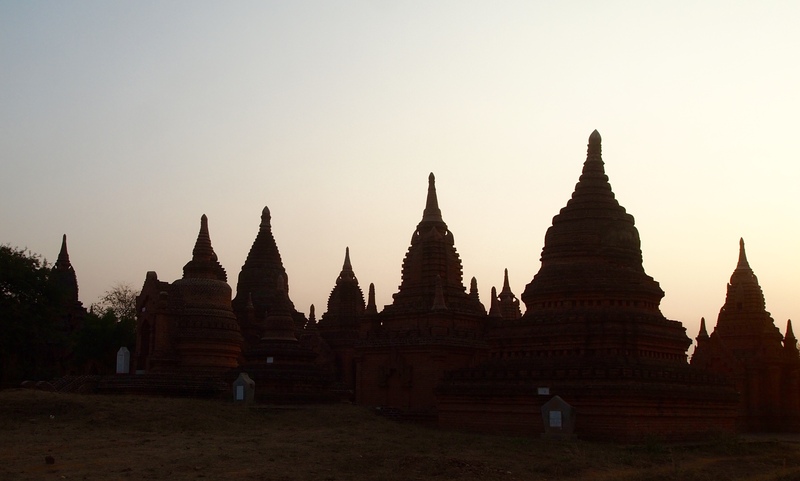 Many tourists apparently come here to watch the sun rise. 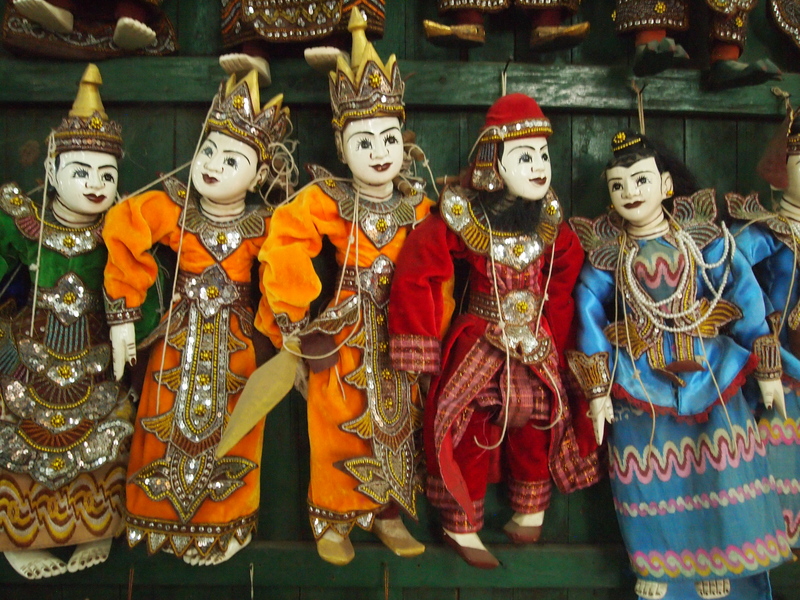 Girls inside Ywa Htaung Gyi Temple work on handicrafts, which they also sell. 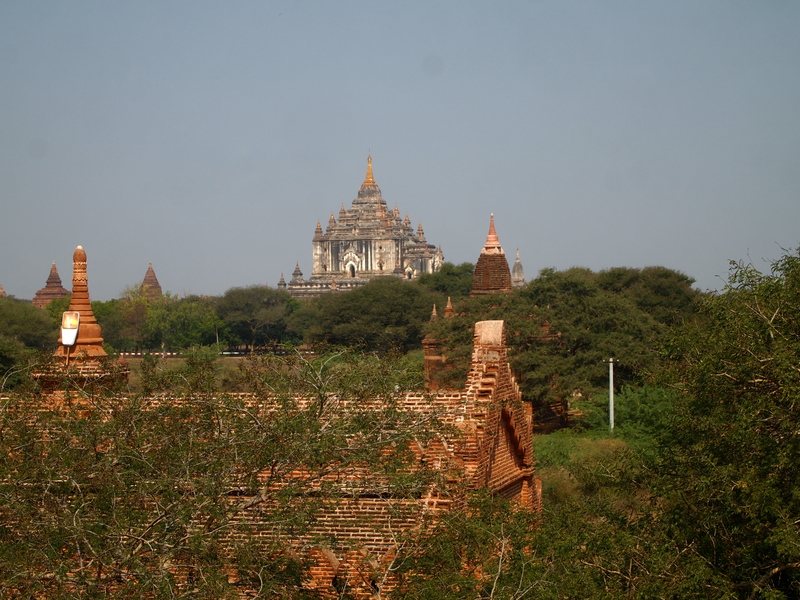 It’s only about 4:30 in the afternoon, not time for sunset yet, so I head next to Gawdawpalin Phaya, which looms over Old Bagan at 197 feet (60m). 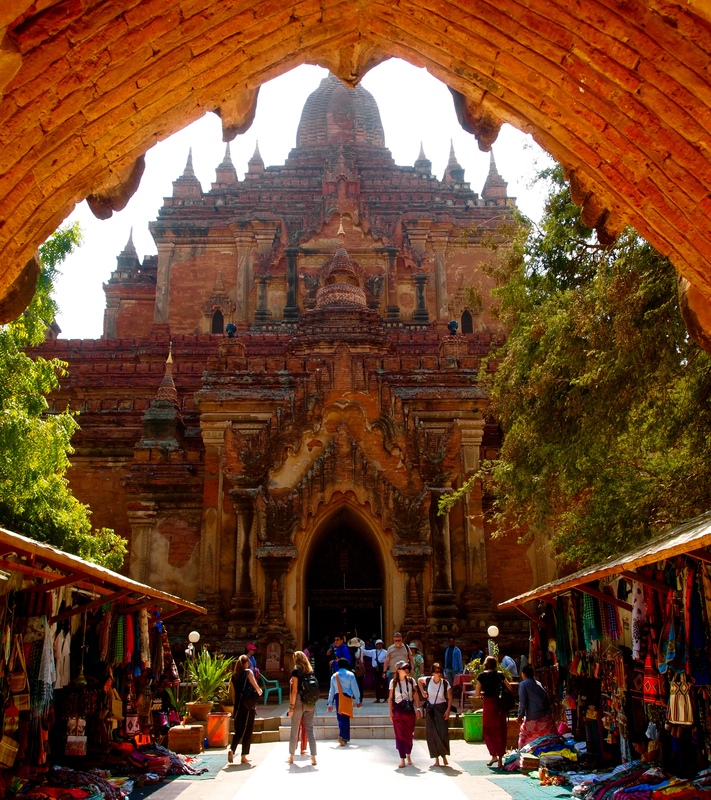 It’s one of Bagan’s largest and most imposing temples. 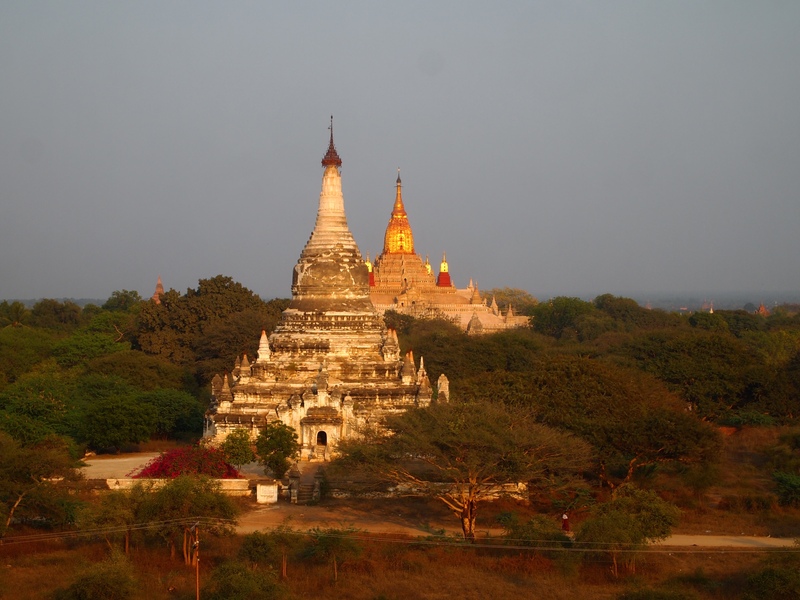 It’s name means “Platform to which Homage is Paid,” says Lonely Planet Myanmar (Burma). 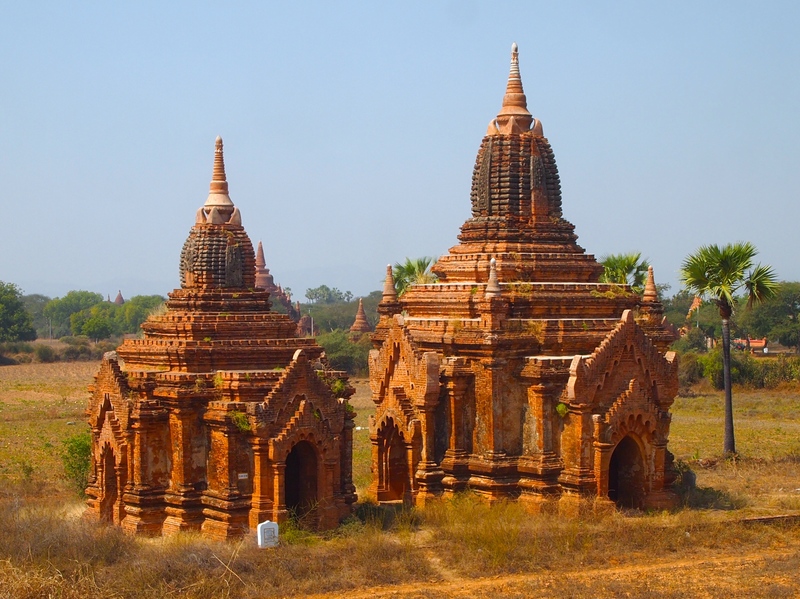 It was built through the reigns of Narapatisithu and Nantaungmya, and is considered the crowning achievement of the late Bagan period, according to Lonely Planet Myanmar (Burma). 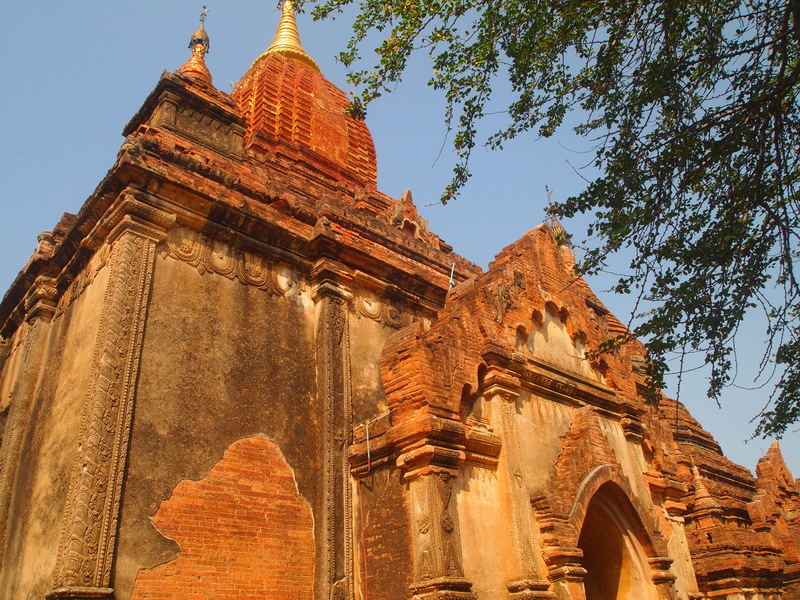 This temple sustained great damage during the 1975 earthquake, as it sits near the quake’s epicenter. 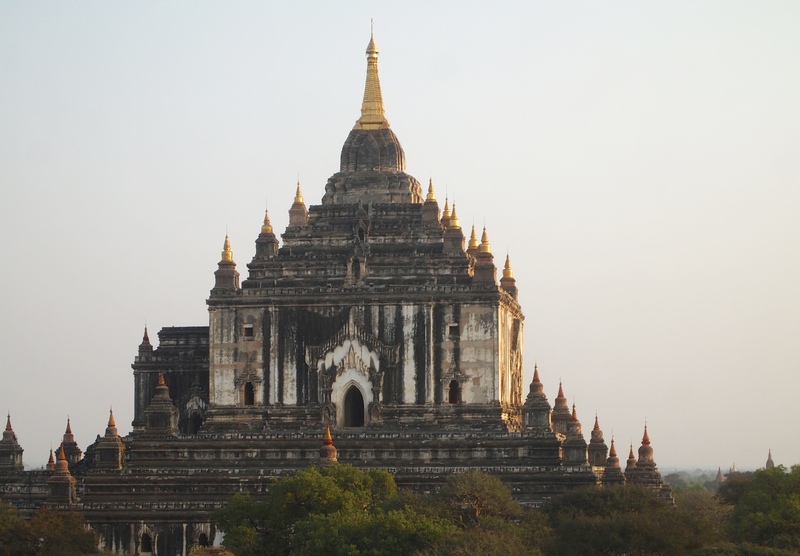 It had to go through a major reconstruction after the earthquake. 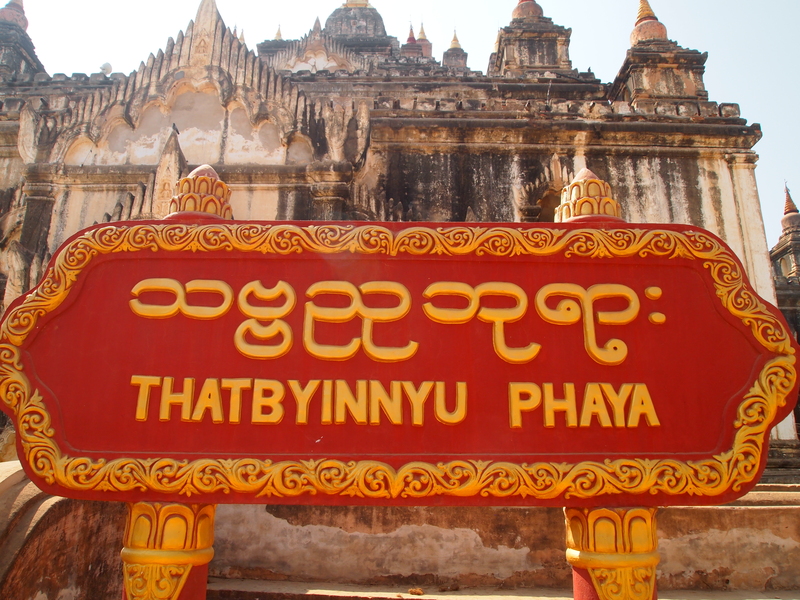 Next, I stop briefly at Myet Taw Pyay Phaya, believed to have been built by King Kyanzittha. 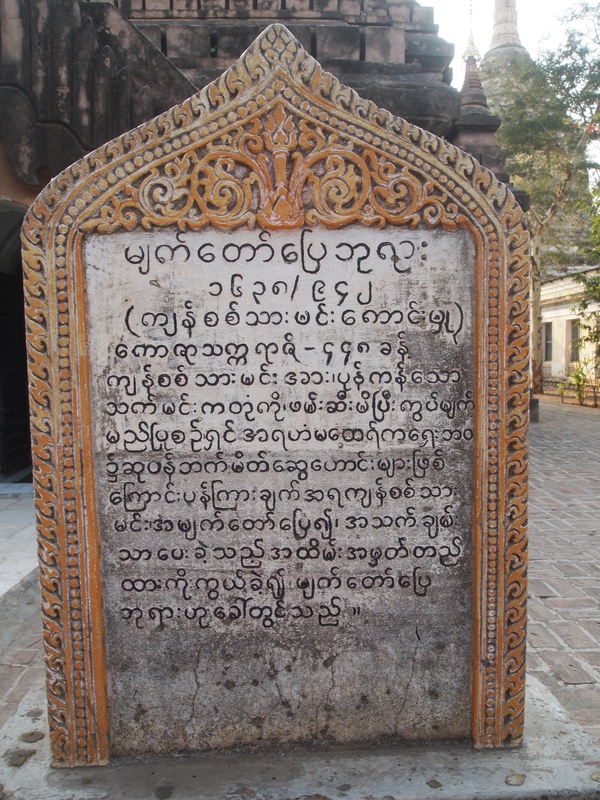 Apparently, during his reign, King Thet Min Katon of Rakhine turned on the sitting king, who sent his warriors to capture the rebellious king alive. 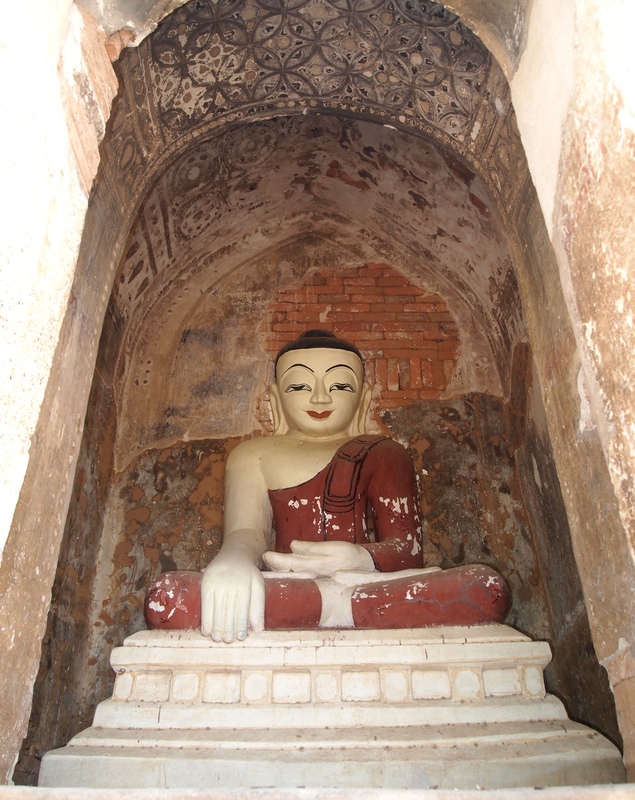 As King Kyanzittha prepared to execute the rebel king for high treason, Shin Arahan pleaded for royal clemency, saying that in previous lives the two kings had taken an oath of faithfulness and promised to help each other when in trouble. 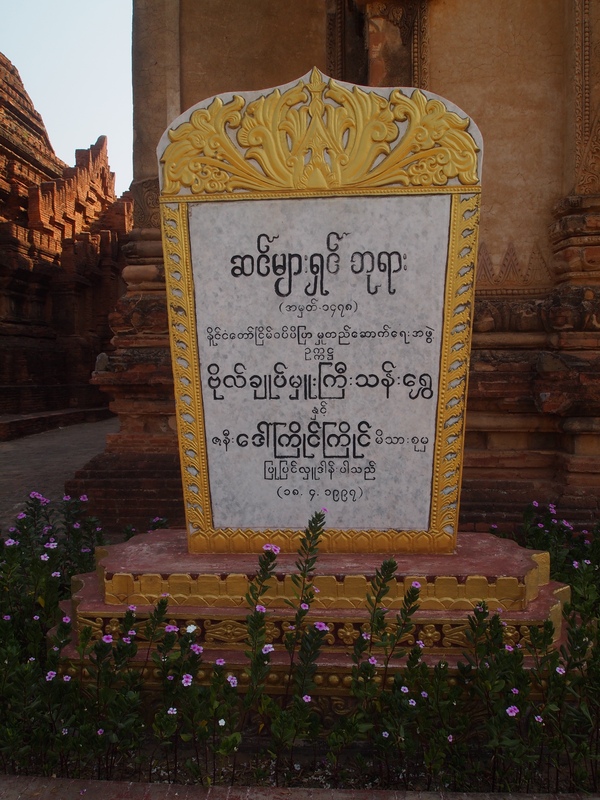 King Kyanzittha spared the traitor’s life and built Myet Taw Pyay Paya on the site to commemorate the event. 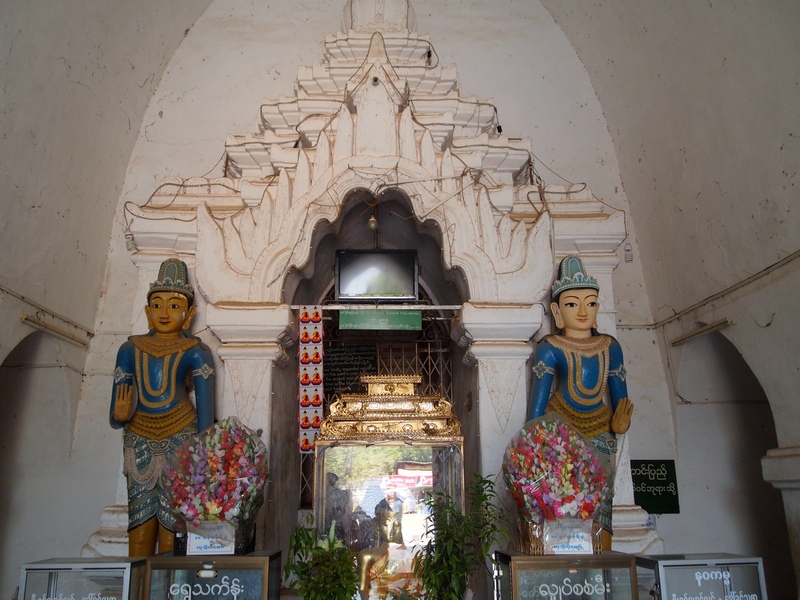 Finally, at around 5:00, I head to Shwe-Gu-Gyi, or “Great Golden Cave,” built by Alaungsithu in 1131, during Bagan’s middle period of temple building. This period transitioned to a light and airy architectural style from the previous period of a dark and cloistered style. 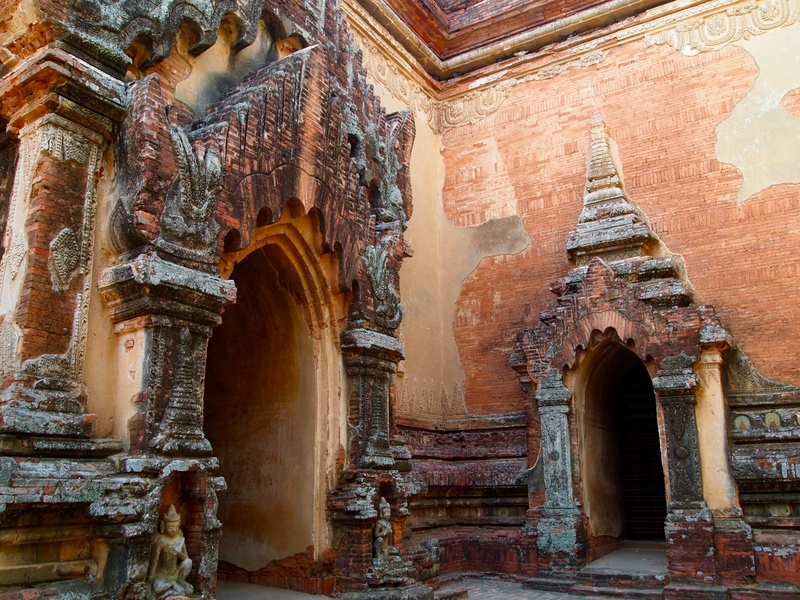 Inside are beautiful stucco carvings and stone slabs that tell some of the history of the temple. 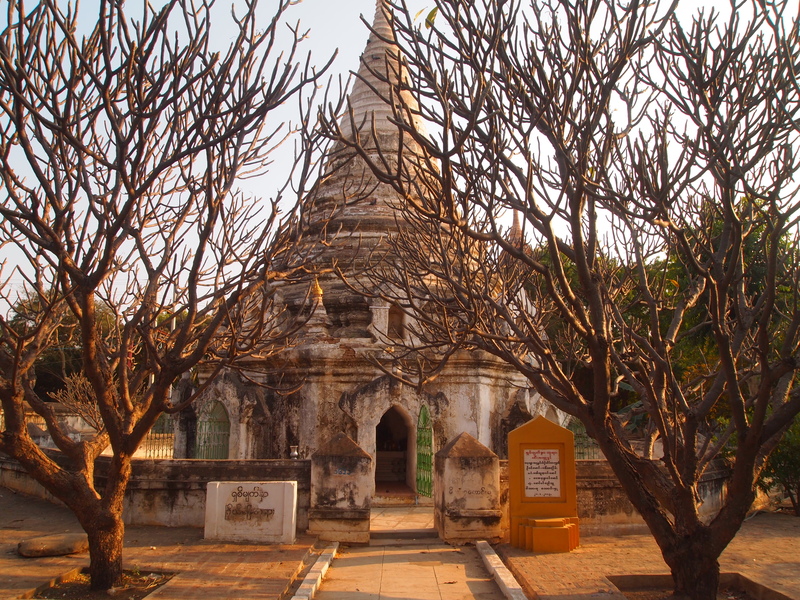 Part of the history not told here is that in 1163, Alaungsithu’s son brought his sick father here and smothered him to death (Lonely Planet Myanmar). My biggest interest here is to watch the sun go down. However, I still have to ride the e-bike back to my hotel, which I don’t particularly want to do in the dark, so I have to leave a bit before sunset. After leaving my sunset views, I ride the e-bike back to the hotel. 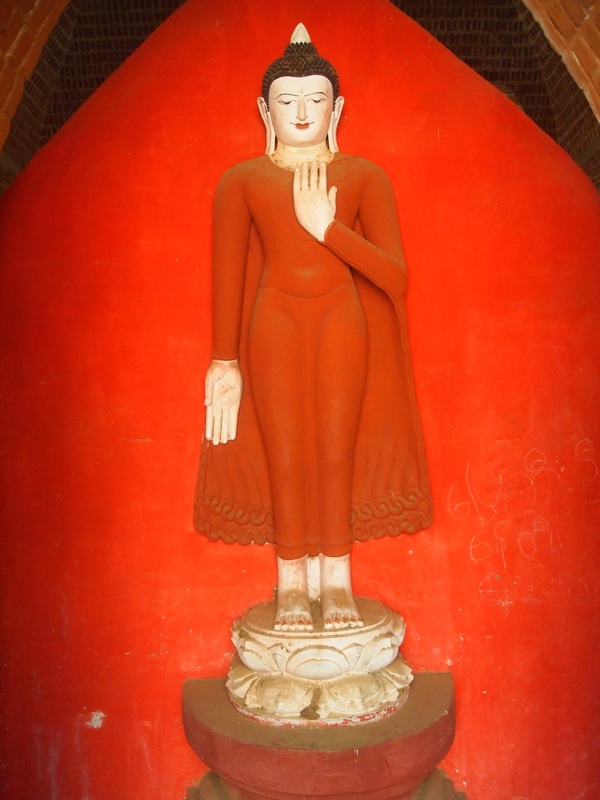 There, I try on the new cotton pants I’ve just bought at Htilominlo Pahto. As I bought them from the same vendor, I assumed they would all have the same fit, but I’m wrong. Several are too small. 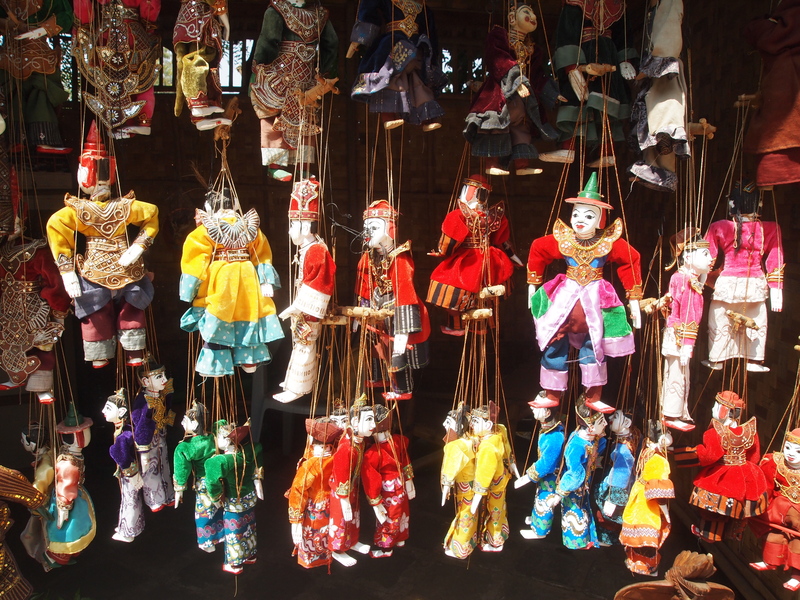 I discard them by hiding them at the top of one of the cupboards in the room. 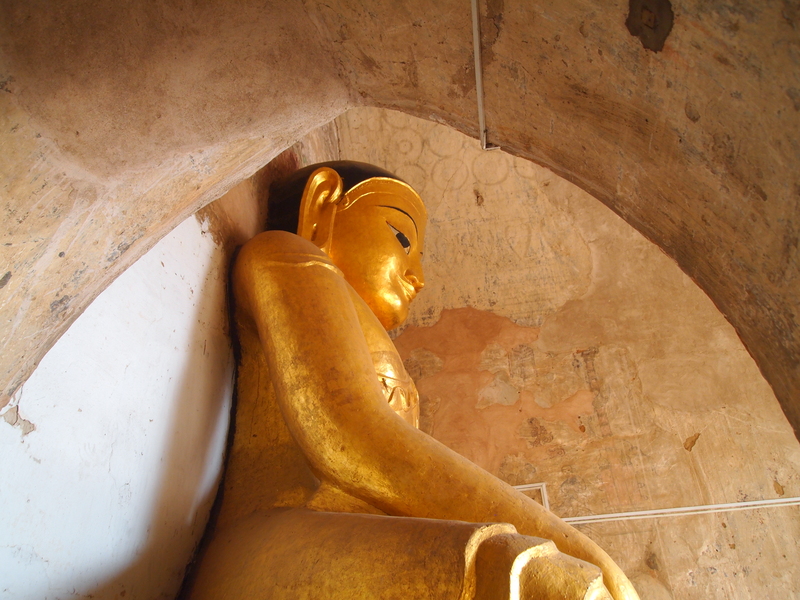 I do this often when I travel and want to lighten my load. I’ve found if I leave things out where housekeeping can see them, then they come running after me at check-out, telling me I’ve forgotten something. For the little amount of money I spent on them, I may as well leave them for someone else to discover. At this point, from all the dust I’ve been kicking up all day, I am coughing and my throat is rough and dry as sandpaper. 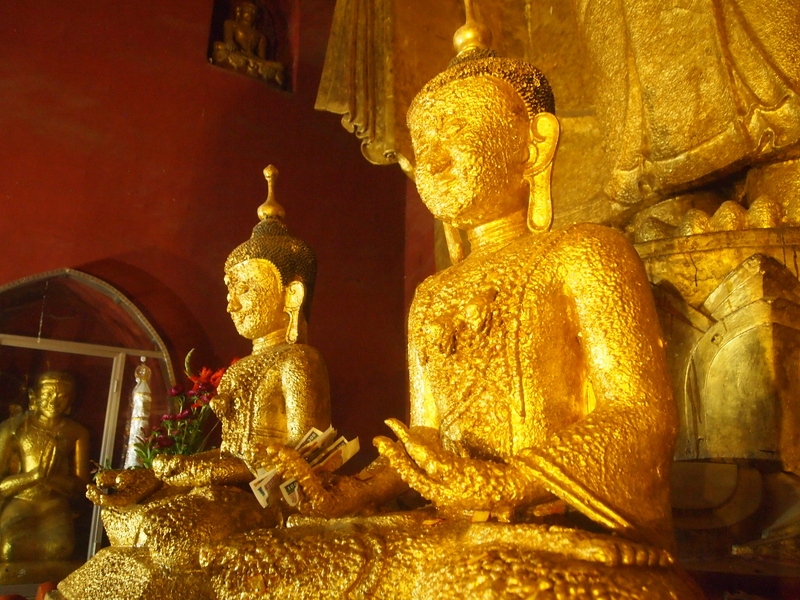 I decide I need a glass of wine and a good dinner at the Green Elephant. I take quite a long walk to the open-air restaurant. 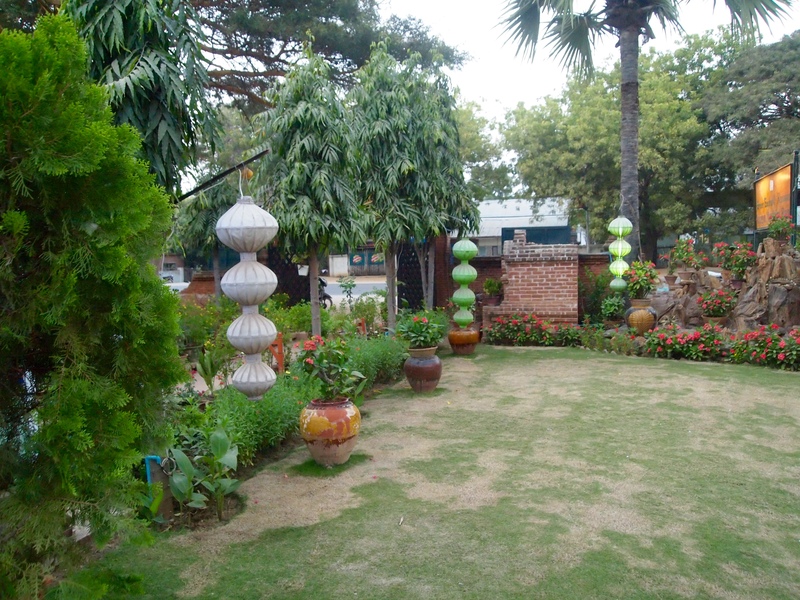 I enjoy the views of the grounds as I eat a dinner of mini-spring rolls, tomato and peanut curry, rice, and a glass of red wine. All the while, I am coughing and clearing my throat. I’ve planned to visit Mt. 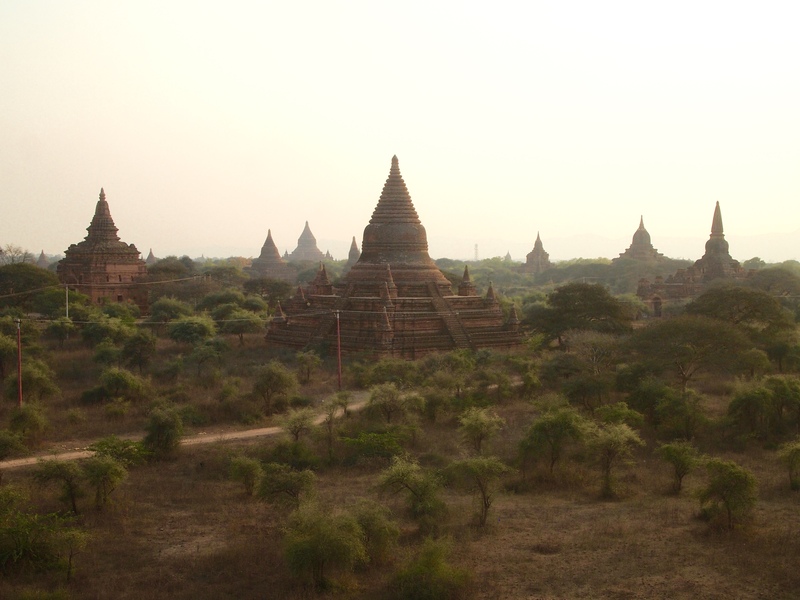 Popa tomorrow, which should give me a break from being exposed to the dust on the plains of Bagan. 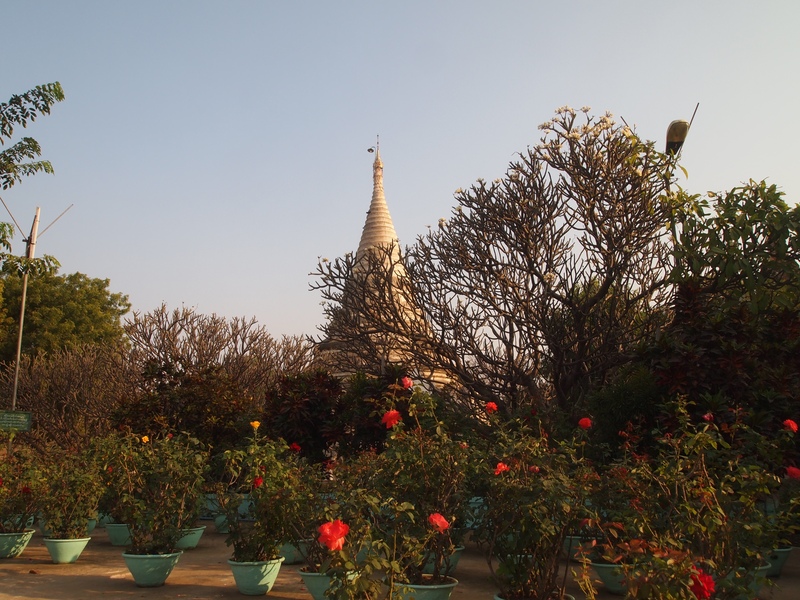 Friday, February 20: This morning after having a buffet lunch on the lawn of the Floral Breeze Hotel, I rent an e-bike for 7,000 kyat, or around $7, for the whole day. I’ve never driven an e-bike before, so this will be a challenge. The rental guy shows me briefly how to drive it, and I’m off. The brake and the accelerator are both on the handlebar of the e-bike. It turns out this will present me with some challenges and funny scenes throughout the day. 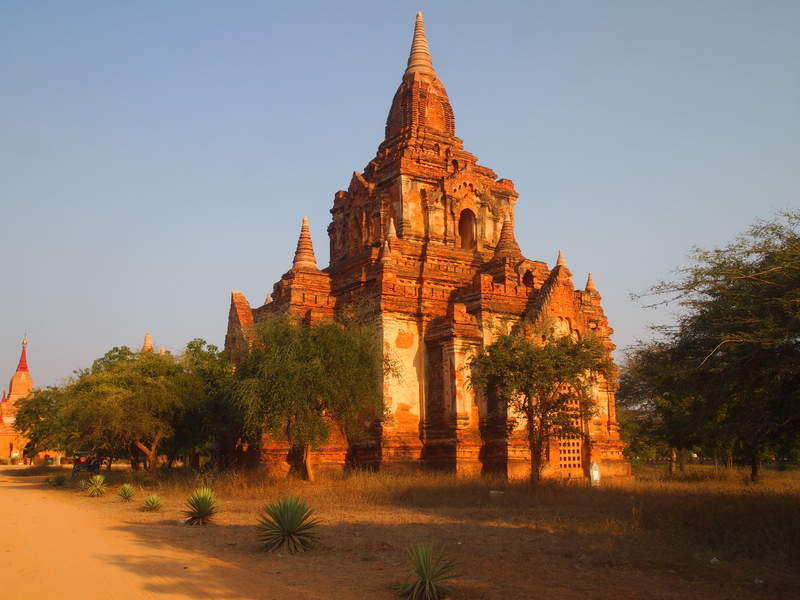 I drive down the main road in New Bagan, which luckily isn’t heavily traveled, and cruise smoothly along until I come to the first temple, #1056, name unknown. I pull up to the entrance on the dusty road and hop off the e-bike. With a start, the bike takes off with me hanging for dear life to the handlebars. It ends up going up some of the rough ground with me running frantically after it, still attached, and then the bike hits a bump and falls down on top of me. Ouch! It’s a lot heavier than it looks. 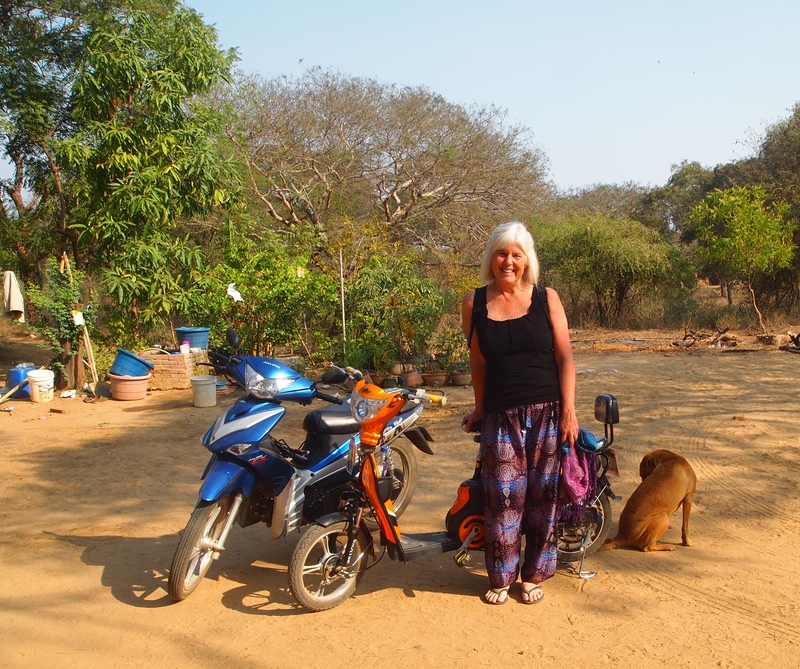 I get out from under the bike, pick it up, and it spurts to life again, running away with me again. This time it doesn’t get far as I realize I need to stop turning the accelerator on the handle. I do so and park the bike, shaking and dusting myself off after the whole ordeal. 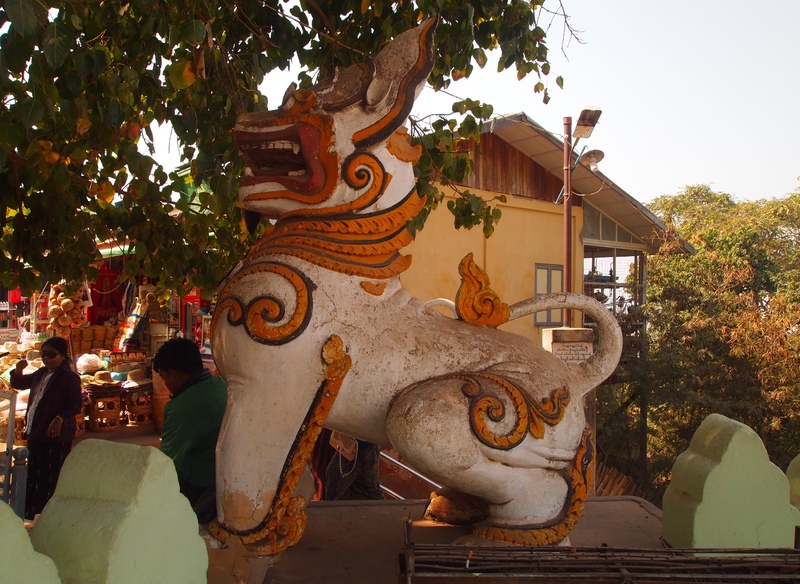 There is another couple with a child at the temple and they have a laugh at my shenanigans and offer to help. There isn’t much they can do at this point, but I do take them up on their offer to take a picture of me. 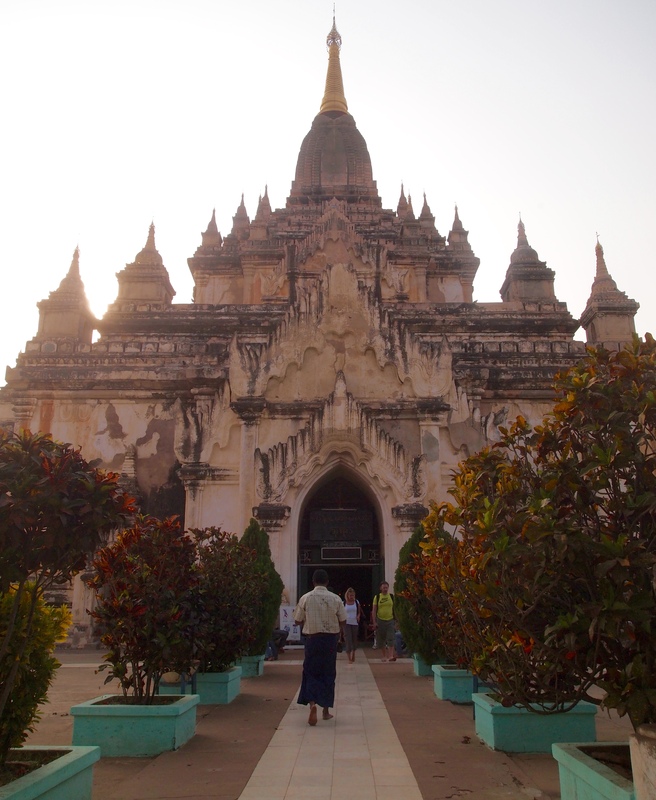 Besides the fun of riding the e-bike today, I’m also wearing some of the ubiquitous baggy cotton pants that so many tourists throughout Bagan are wearing. It feels like I have pajamas on. 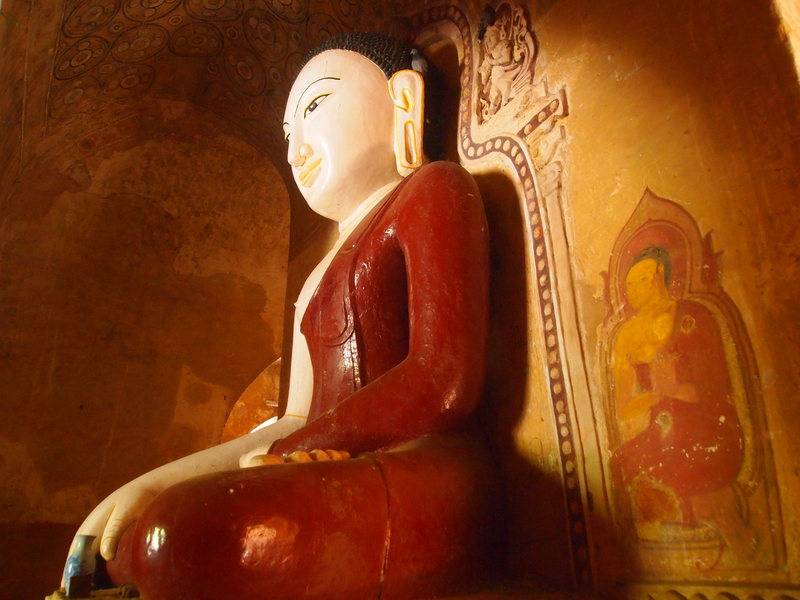 What could be better than riding an e-bike in PJs through thousands of gorgeous temples on the plains of Bagan? 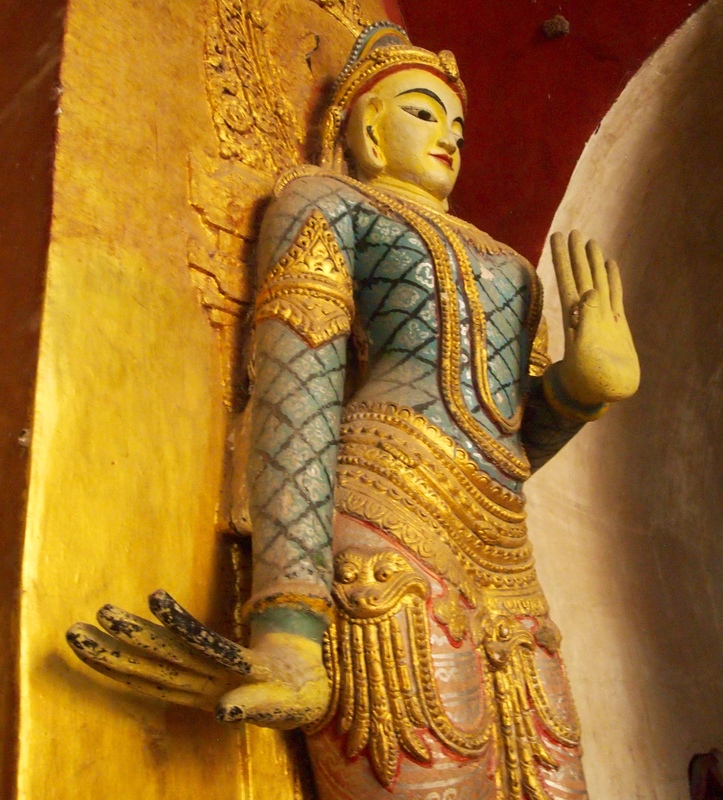 Next, I venture to another nearby pair of temples, on foot, leaving my e-bike on the sidelines to give myself a break. I’m now a little worried about taking it back on the road, afraid that I won’t be able to stop the bike in an emergency. 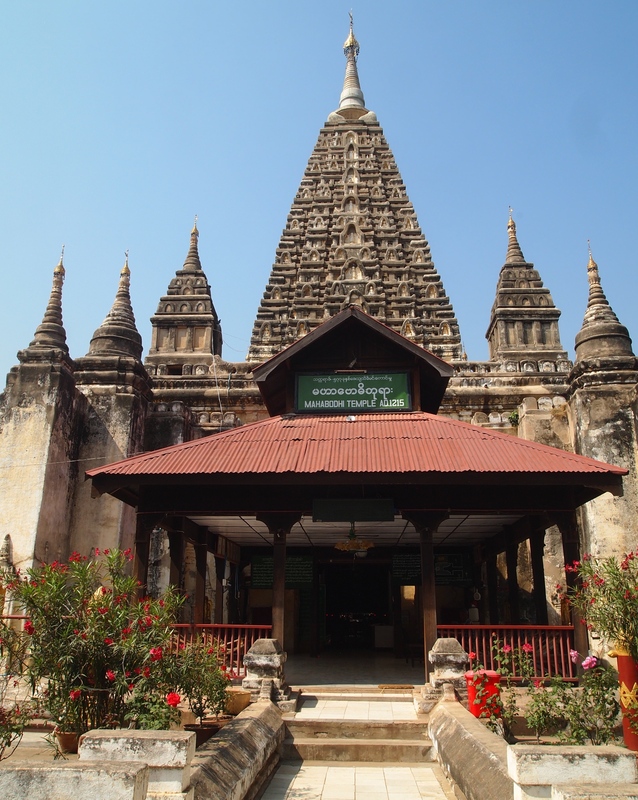 The temples are a side-by-side stupa and shrine, Seinnyet Nyima Paya & Seinnyet Ama Pahto. 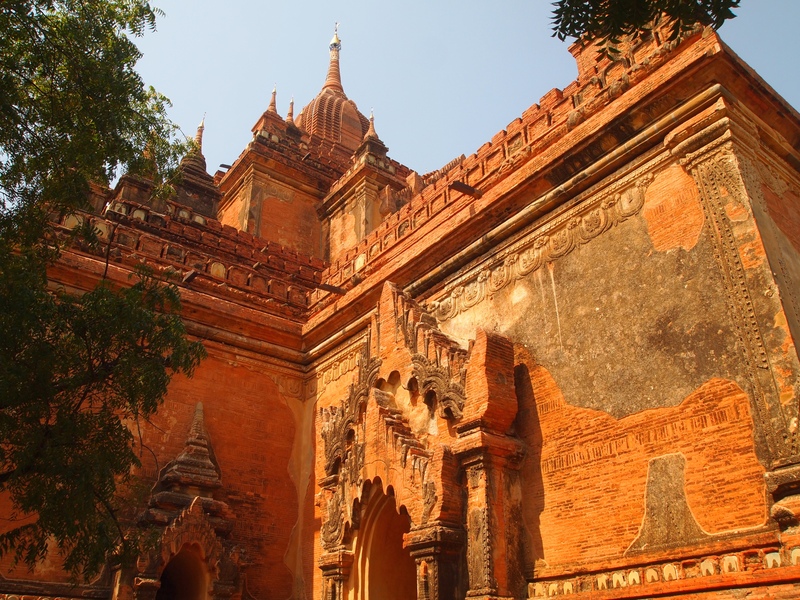 They’re traditionally ascribed to Queen Seinnyet in the 11th century, although, according to Lonely Planet Myanmar, they clearly point to a period two centuries later. 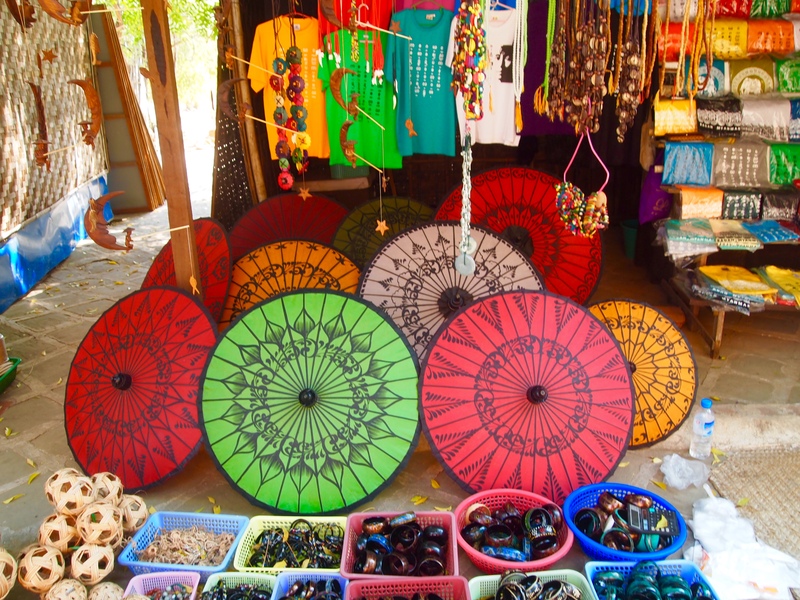 The zedi rests on three terraces and is topped by a beautiful stylized umbrella. 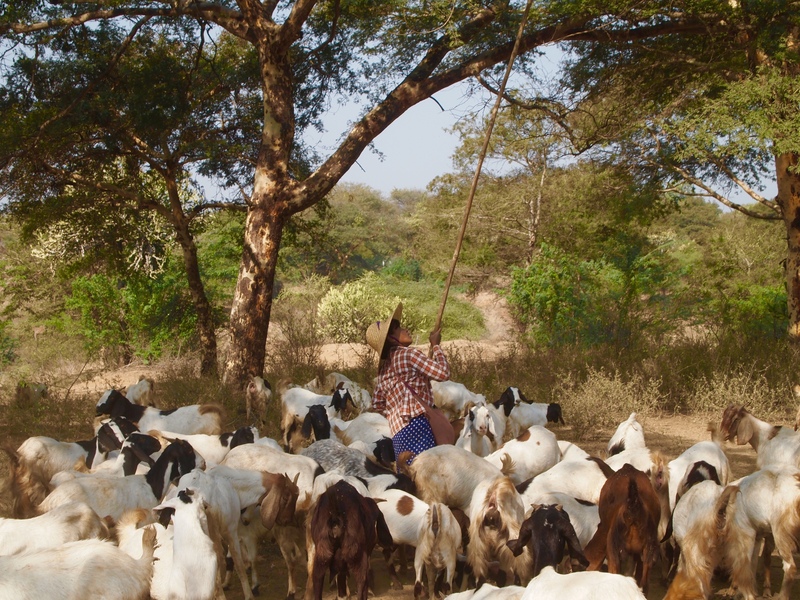 When I finally get up the nerve to get back on the bike, I ride for a bit until I come across a herd of goats. 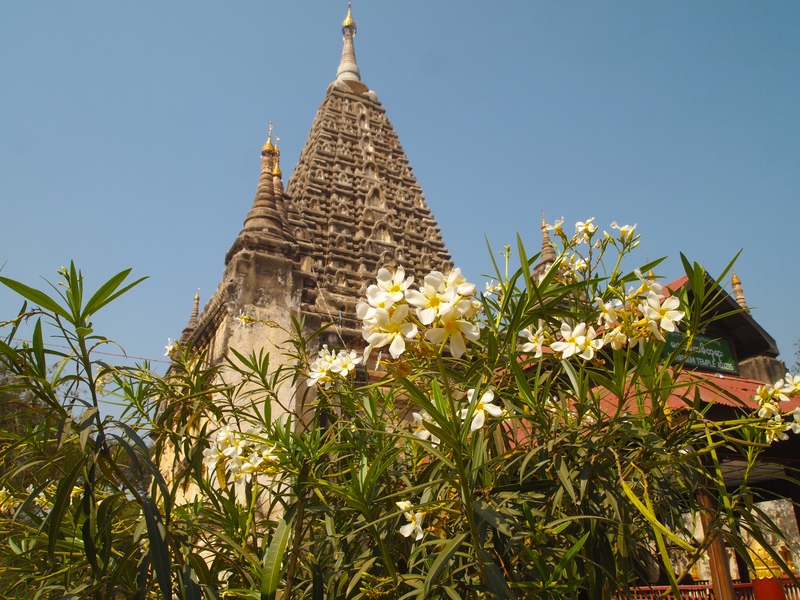 As I carefully drive up and park my bike at Somingyi Kyaung, I see a Japanese young woman across the road who is having the same problems with her e-bike as I did. She’s running frantically after the bike, which is taking off with her holding on dearly to the handlebars! I can’t help but laugh and I tell her I was just having the same problems. 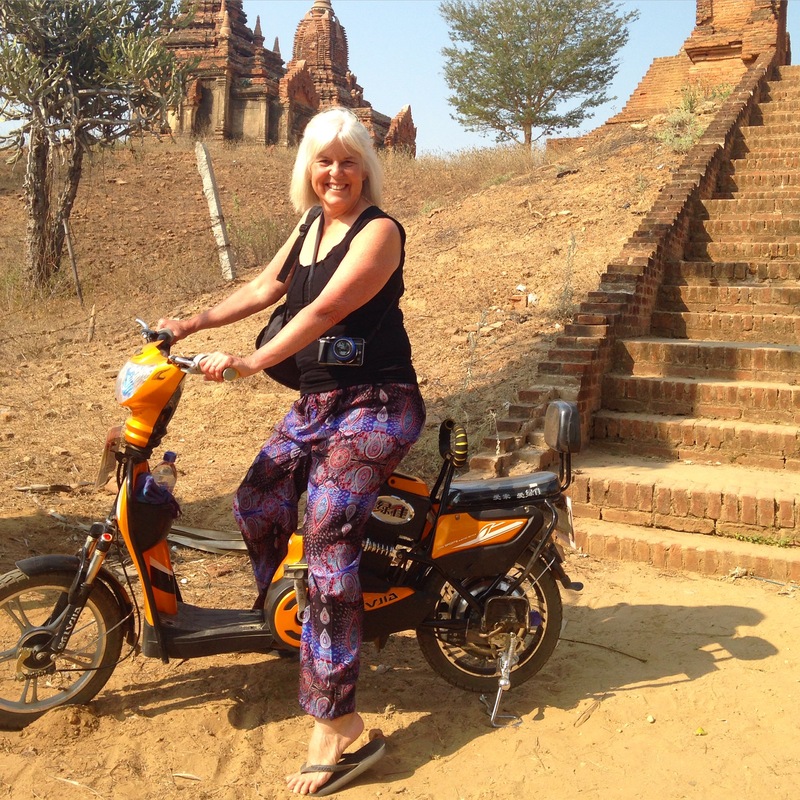 We both have a good laugh over the whole affair, and then we take pictures of each other on our e-bikes. 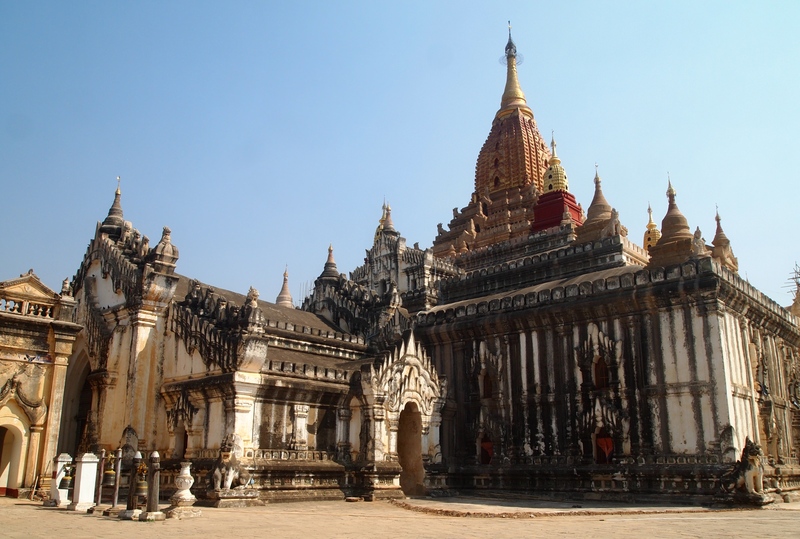 We walk up together to Somingyi Kyaung, and she tells me she is traveling alone. Her name is Sunoko and she works in interior design in Shanghai. 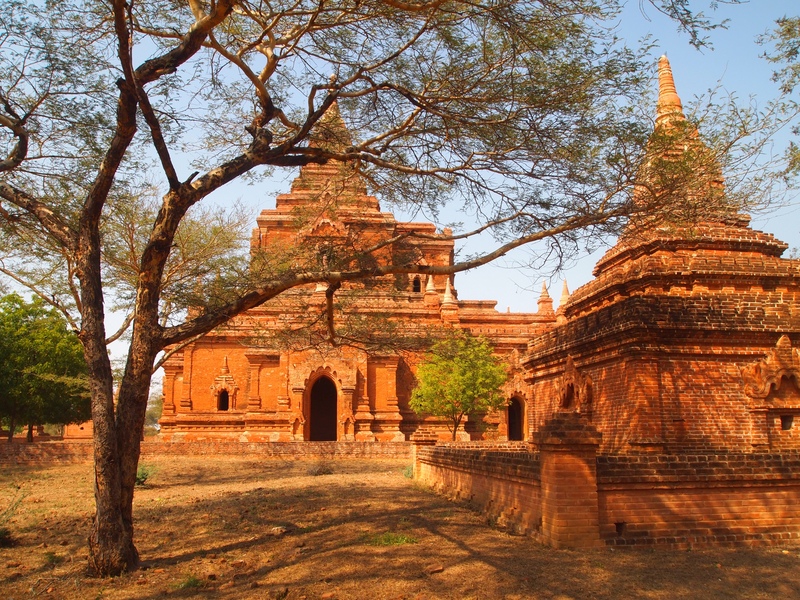 Somingyi Kyaung is a typical late-Bagan brick monastery, believed to have been built in 1204. 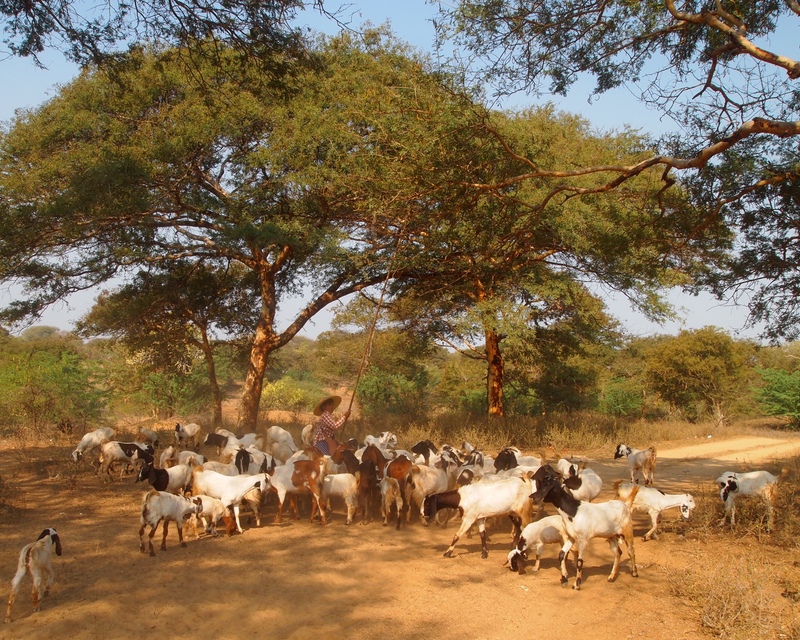 A zedi to the north and a gu to the south are also ascribed to Somingyi. 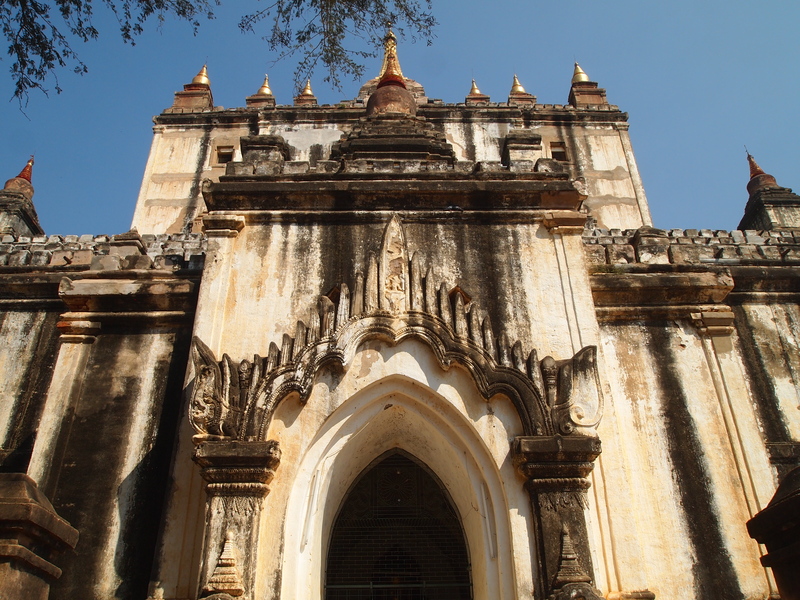 This monastery is unique as it has monastic cells clustered around a courtyard, according to Lonely Planet Myanmar. Sunoko takes another picture of me and I take one of her, and then we take off in separate directions to do our exploring for the day. 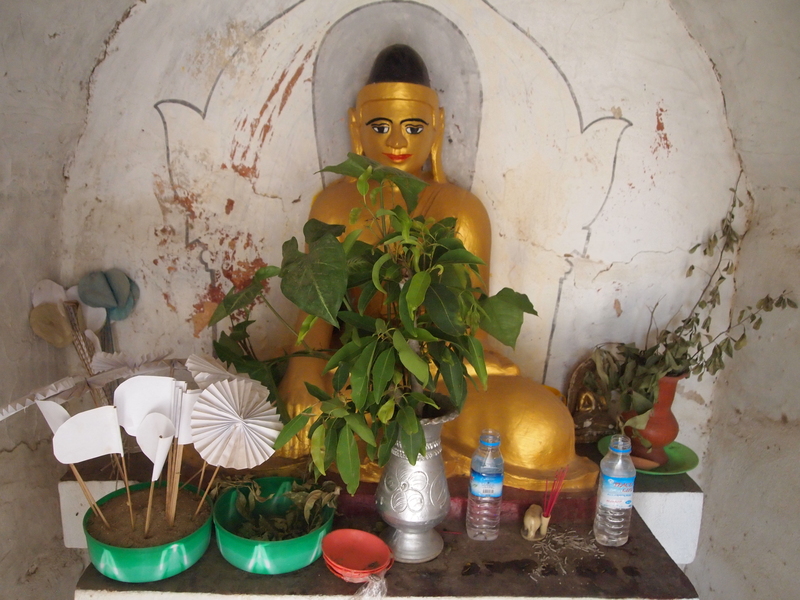 I drop by another temple along the road, but as you can see from the sign below, I can’t read the name of it. 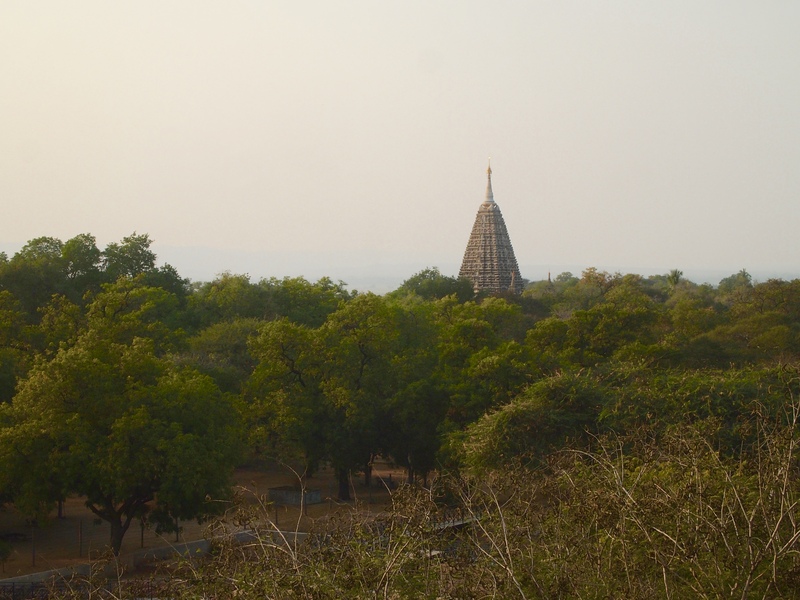 One of the locals tells me when I’m leaving that it’s known as the “many elephants” temple, something like Shimsa (? 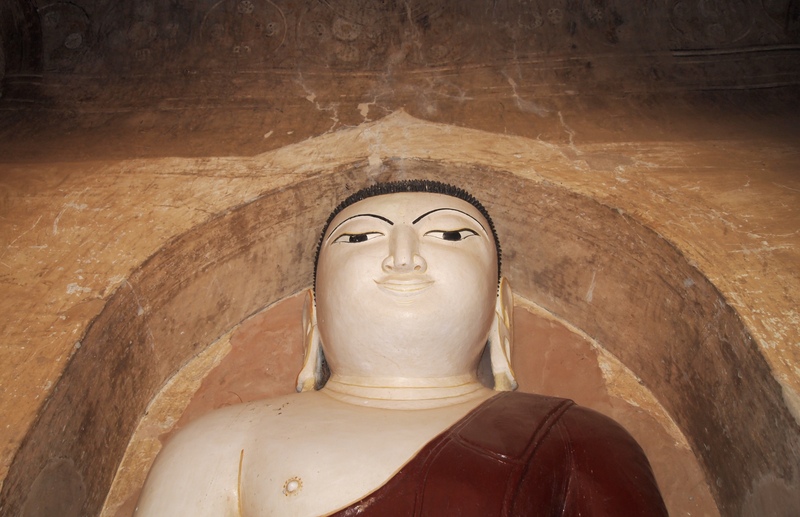 ), but I can’t find any reference to it online or elsewhere. 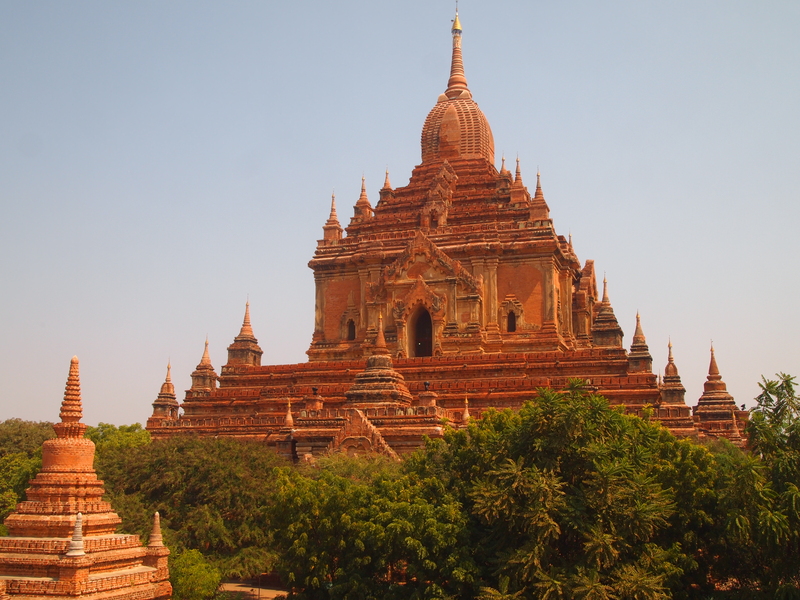 Just another one of Bagan’s thousands of temples. 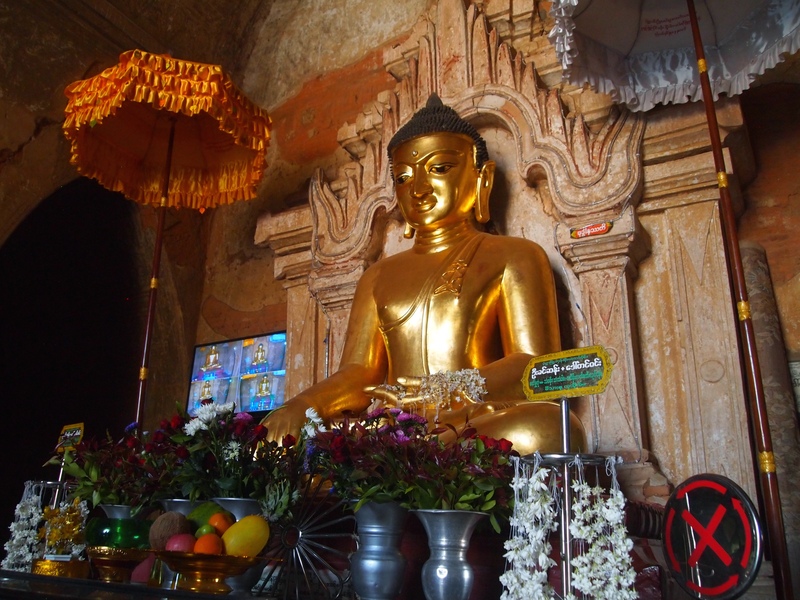 Here, I leave my favorite blue Havaianas flip-flops at the entrance and go in to explore. 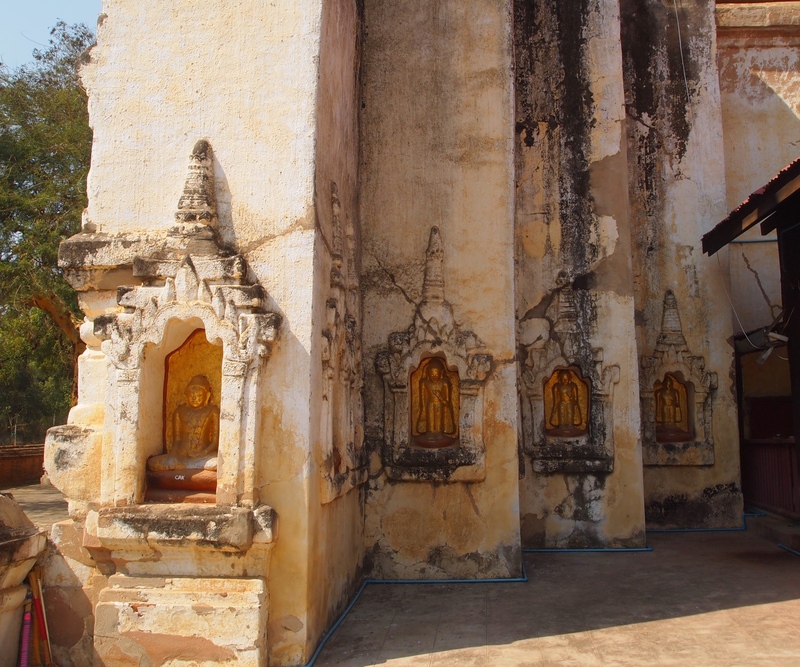 This temple is wonderful, with some marvelous faded frescoes and Buddhas with a variety of enigmatic expressions. 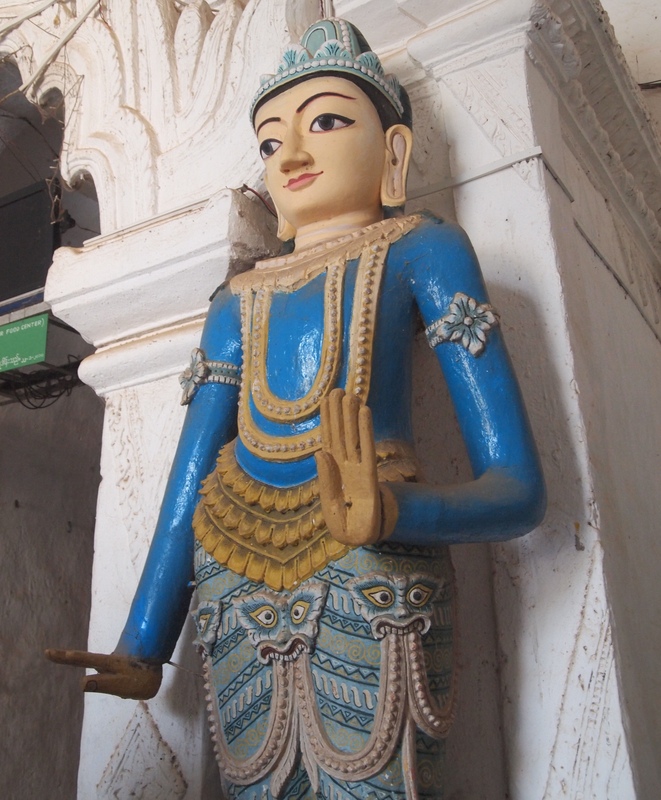 When I leave the “many elephants temple,” I see a pair of blue flip flops and, thinking they are mine, absentmindedly put them on. 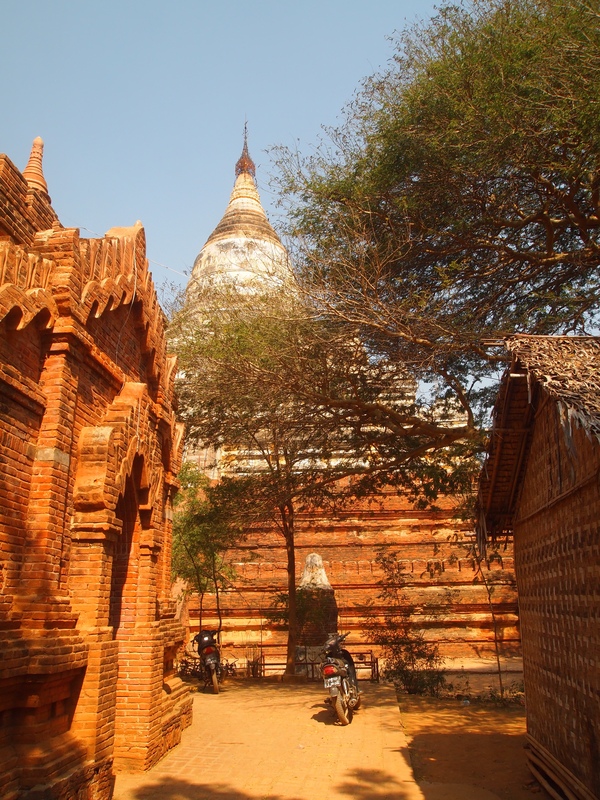 I hop on my e-bike and take off down the road, heading north and then getting off the main Bagan-Chauk Road. 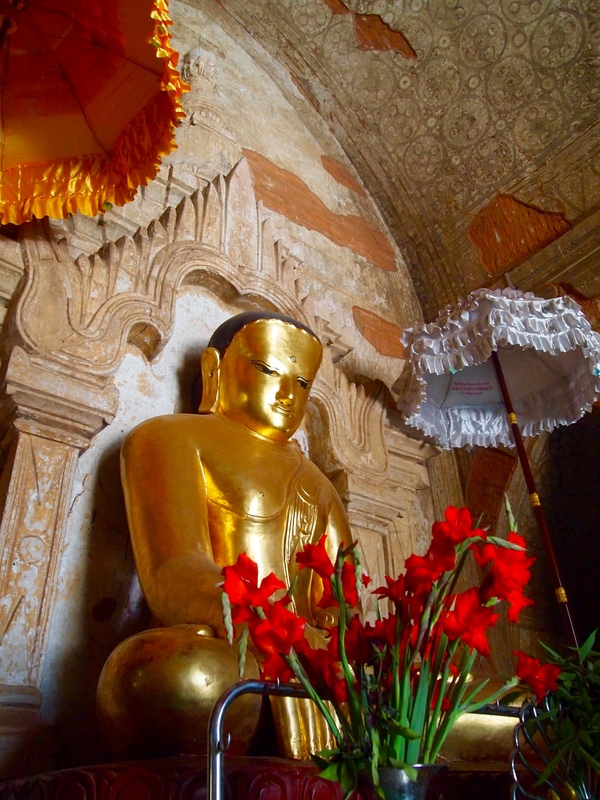 I stop next at Shwe San Daw Pagoda; the name means “Golden Hair Relics” as it enshrines sacred hairs of Gautama Buddha. 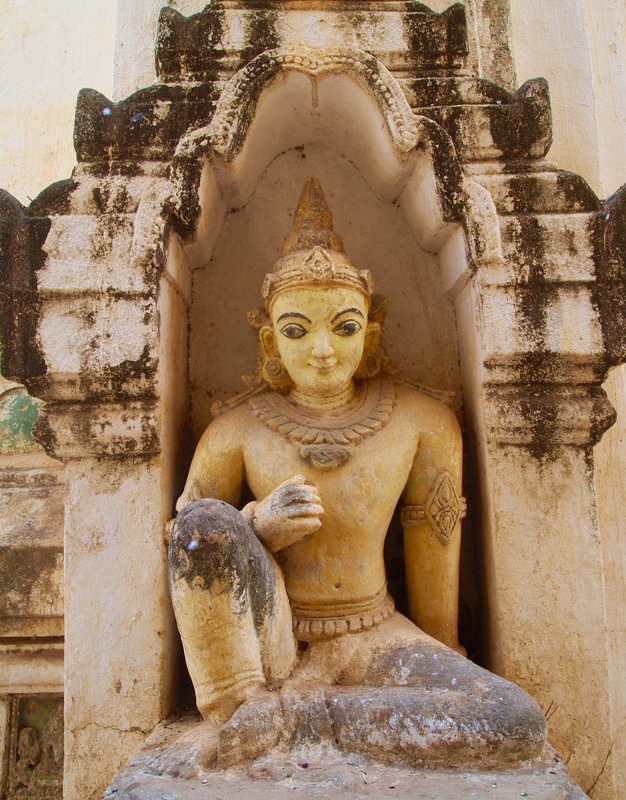 I ditch my flip-flops at the entrance, as you have to do at all the Bagan temples. 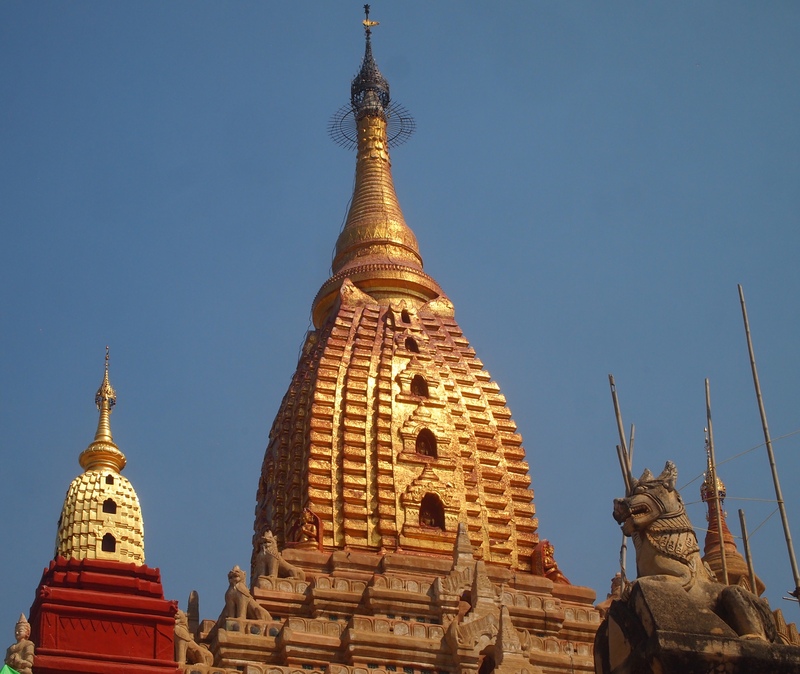 According to Wikipedia: Shwesandaw Pagoda (Bagan), the pagoda contains a series of five terraces, topped with a cylindrical stupa, which has a bejewelled umbrella, or hti. 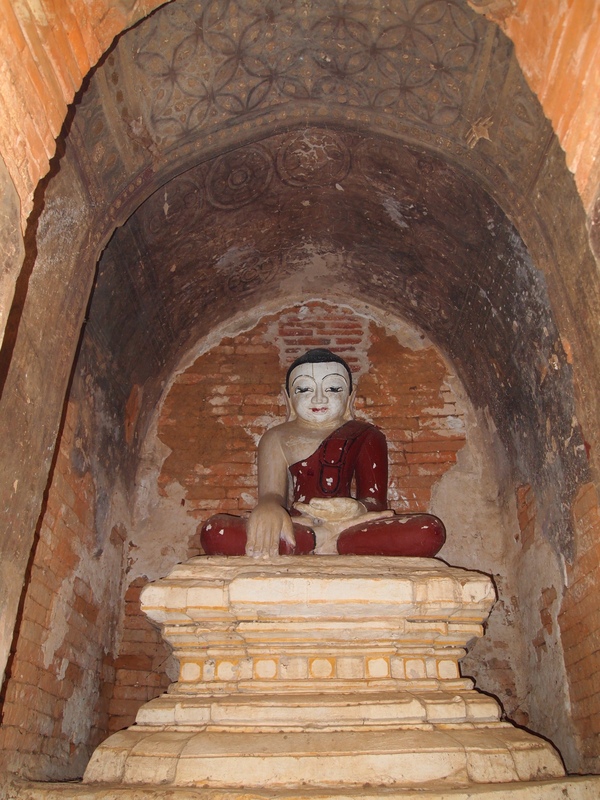 King Anawrahta built the pagoda in 1057. 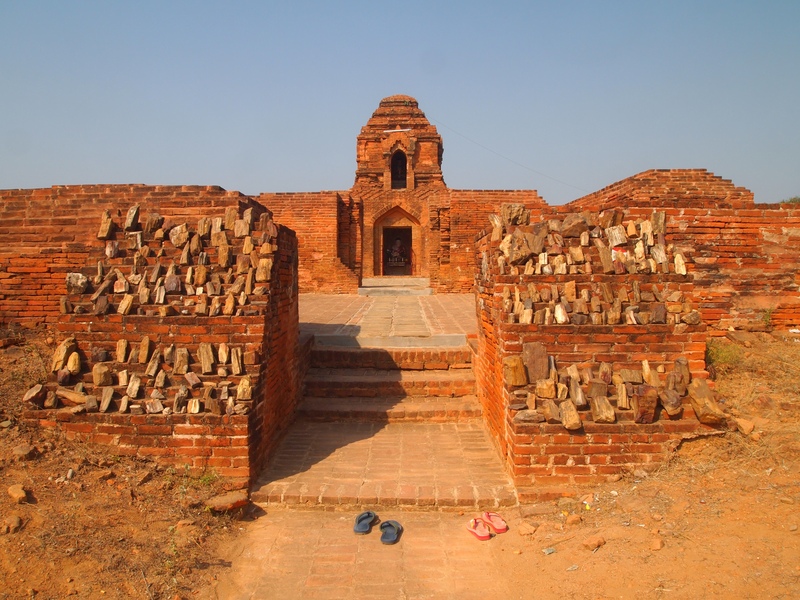 It once contained terra-cotta tiles depicting scenes from the Jataka. 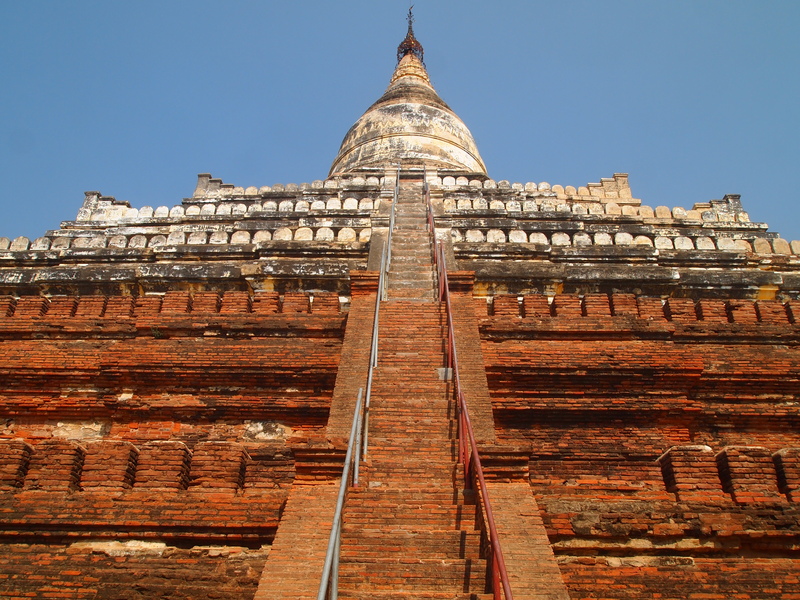 All four sides of the pagoda have a stairway leading up to the fifth terrace. 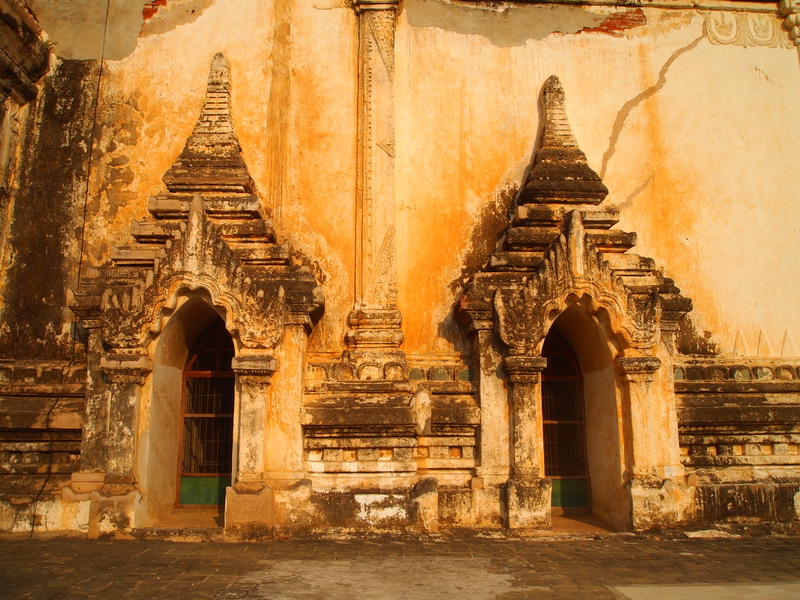 At the side of the second terrace on the west, there is a tunnel dug by robbers which enabled them to access the central chamber in which relics and treasures were enshrined. 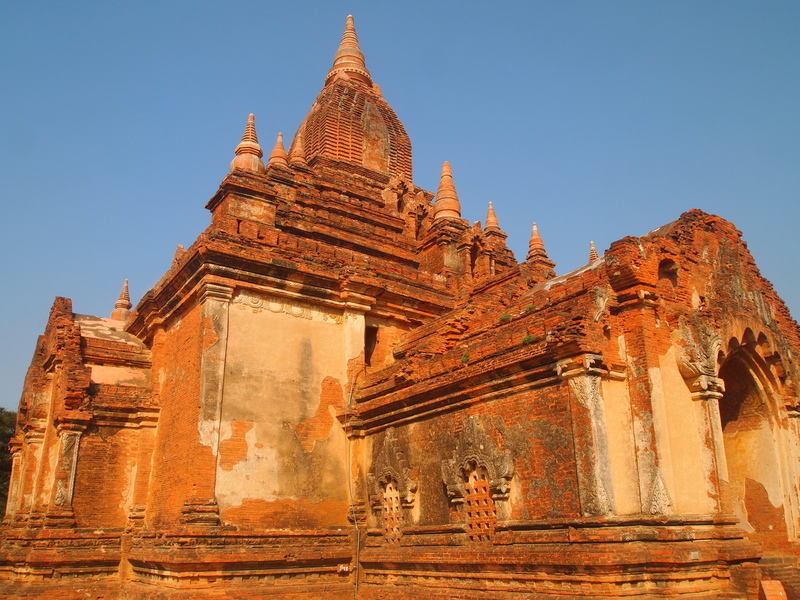 Up till 1957 the whole structure of this pagoda was in its original condition— fine brick-red in color with no plaster covering, according to BaganMyanmar.com: Shwe Sandaw Pagoda. 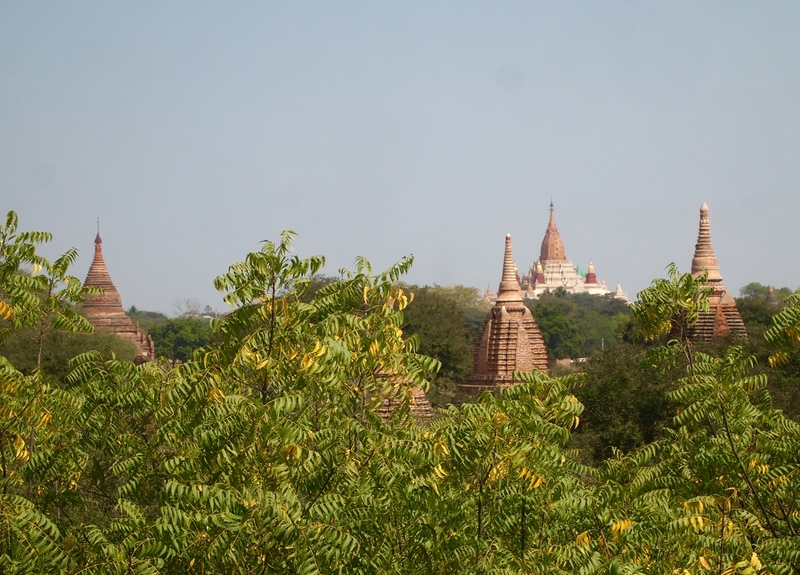 After looking around the pagoda for a while, I take off on my e-bike, where I stop to take pictures looking back on Shwe San Daw Pagoda from afar. 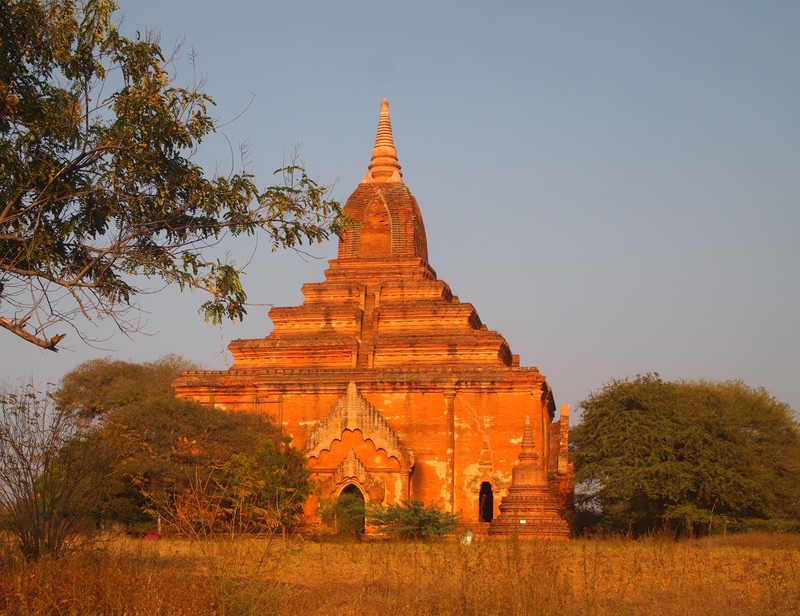 I head off now in search of Sulamani Pahto, one of the most beautiful temples in Bagan, which I saw only in passing yesterday. This is the most fun I’ve had on a holiday in a long time! 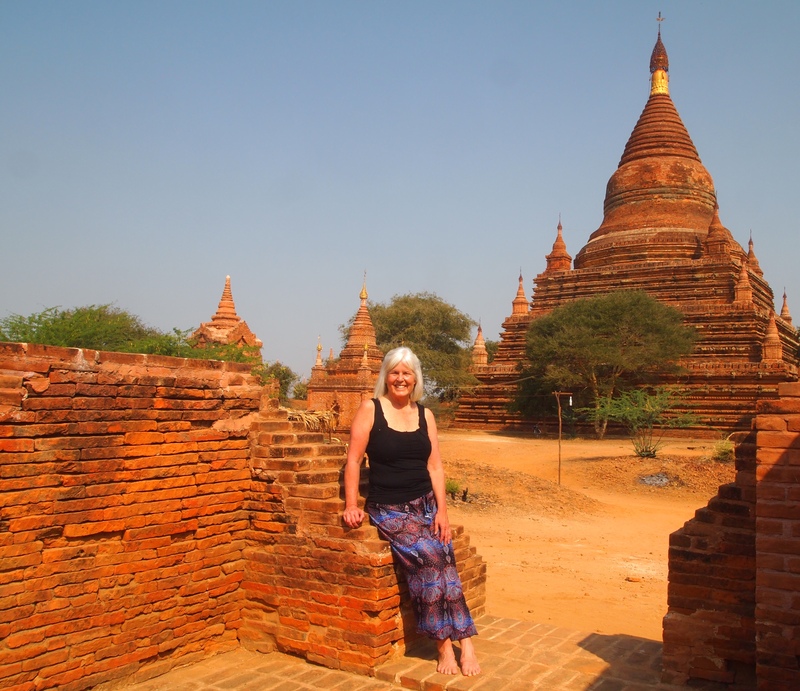 Thursday, February 19: After we finish our tour of the Myinkaba area, we head next to Old Bagan. 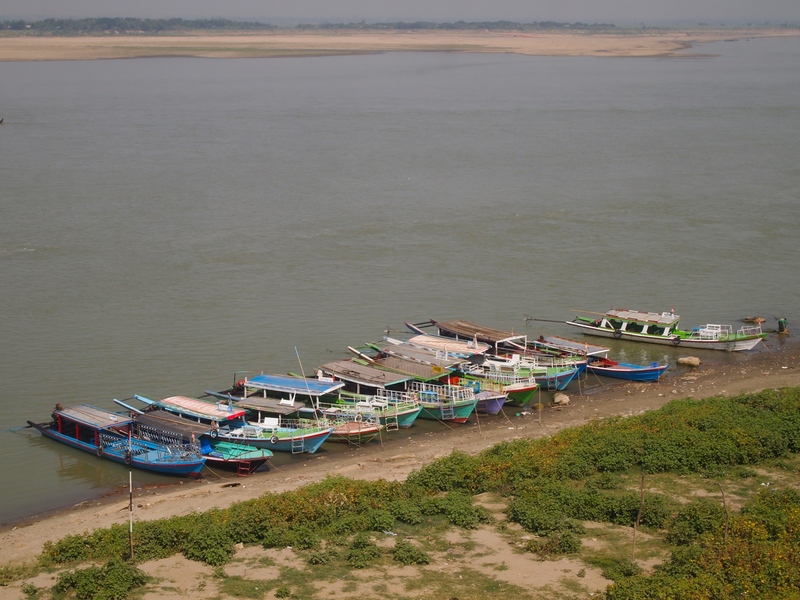 Our first stop is Bupaya on the banks of the Ayeyarwady River. 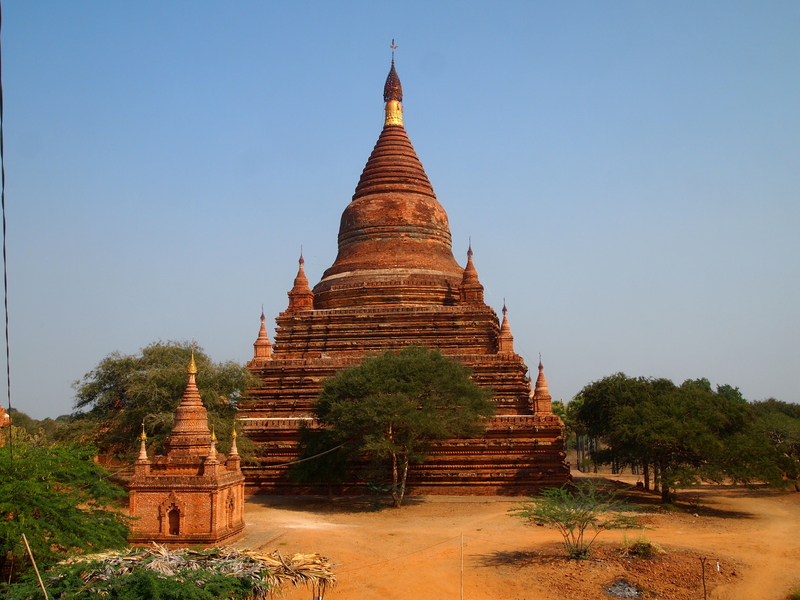 This small pagoda has a bulbous shaped dome, and is widely believed to have been built by the third King of Bagan (formerly Pagan), Pyusawhti, who ruled from 168 to 243 AD. 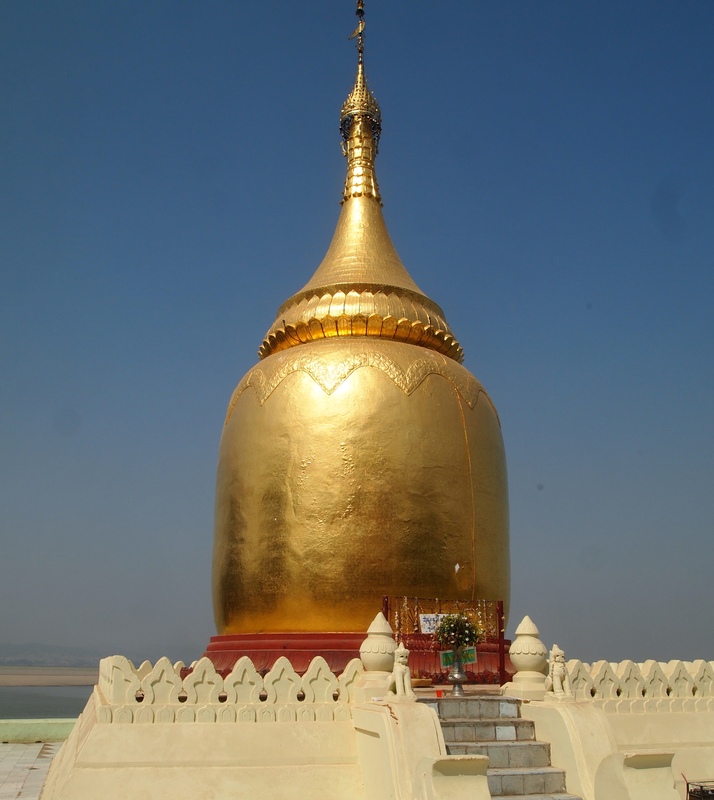 As the bulbous-shaped dome resembles a pumpkin or gourd, it was named “bu” which means pumpkin or gourd, and “paya” which means pagoda (Wikipedia: Bupaya Pagoda). 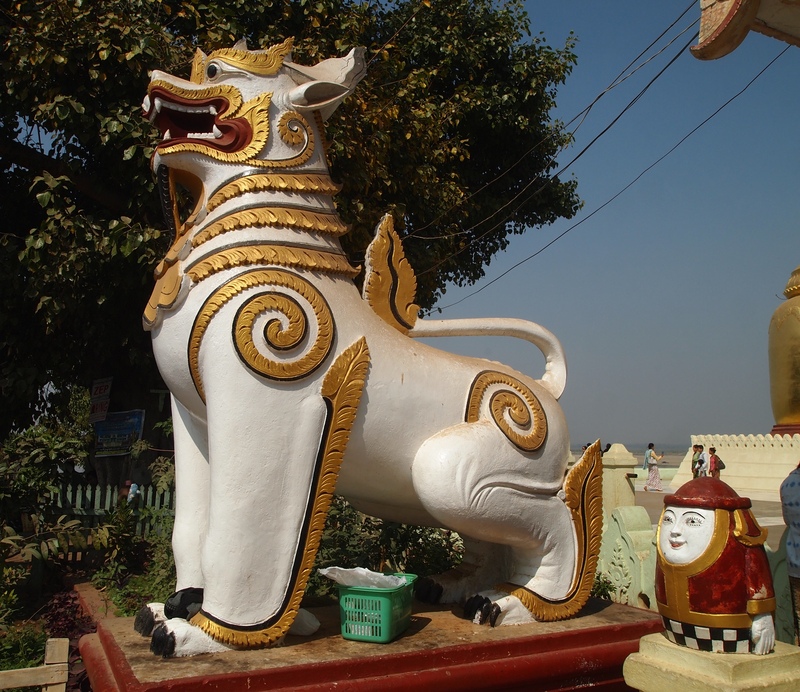 The main pavilion at the entrance is guarded by white and gold Chinthes, Burmese mythological lions. 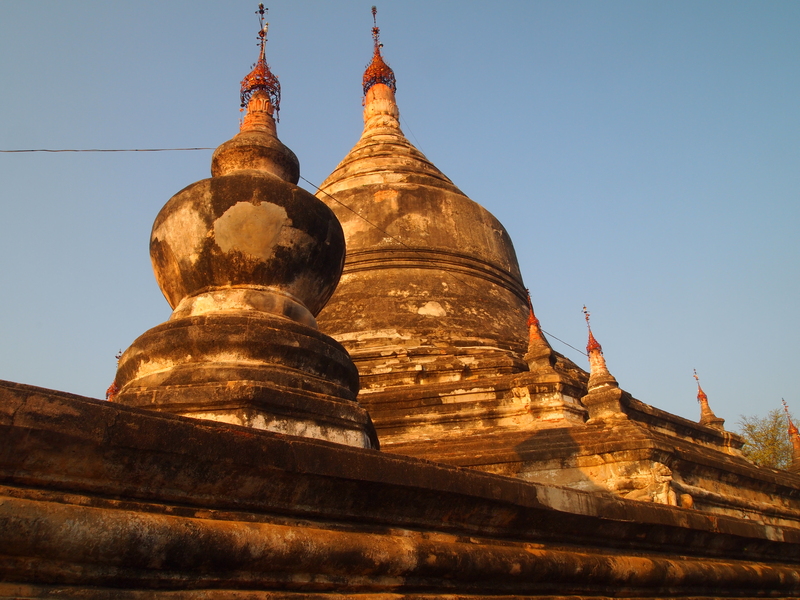 In 1975, a severe earthquake caused the original Bupaya to fall into the Irrawaddy River. 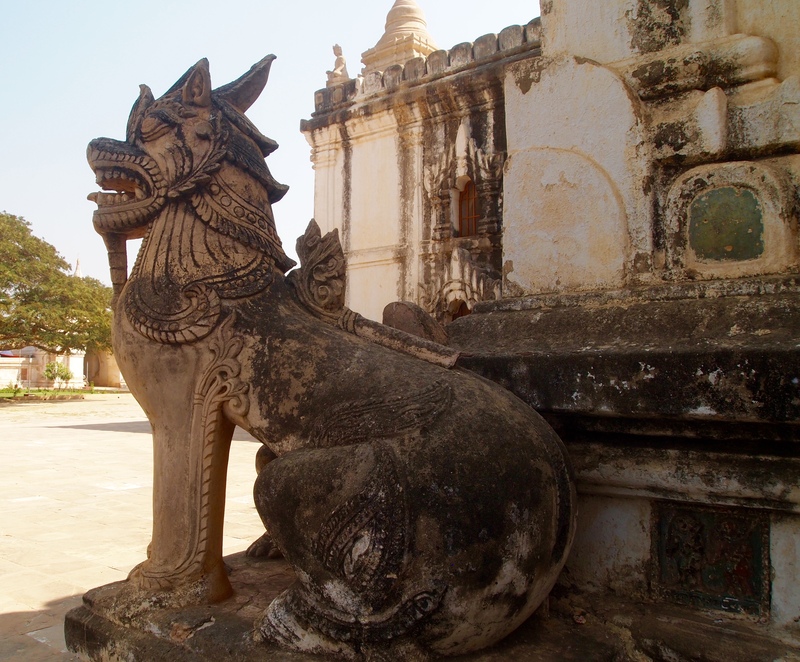 The Pyu-style monument is modeled on an Indian style. 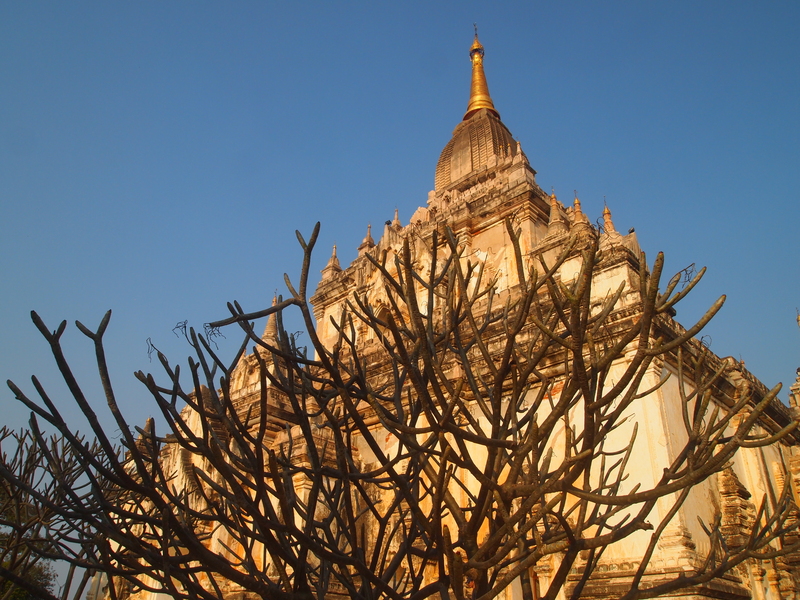 It was rebuilt after the earthquake as a gilded structure with modern materials. 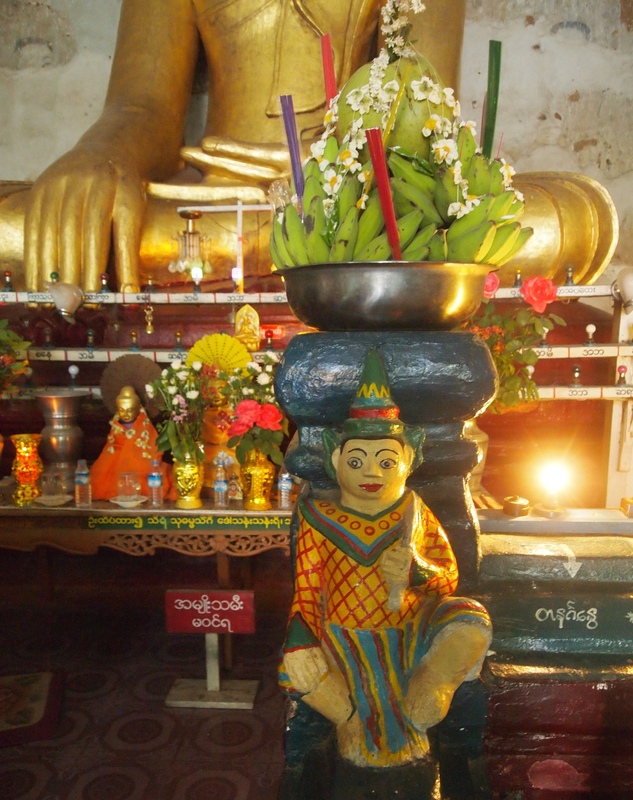 Legend has it that Pyusawhti, before he was King, managed to free the Bagan Kingdom of five nuisances, one of which was the infestation of the Irrawaddy river banks by the bu, a kind of gourd plant. 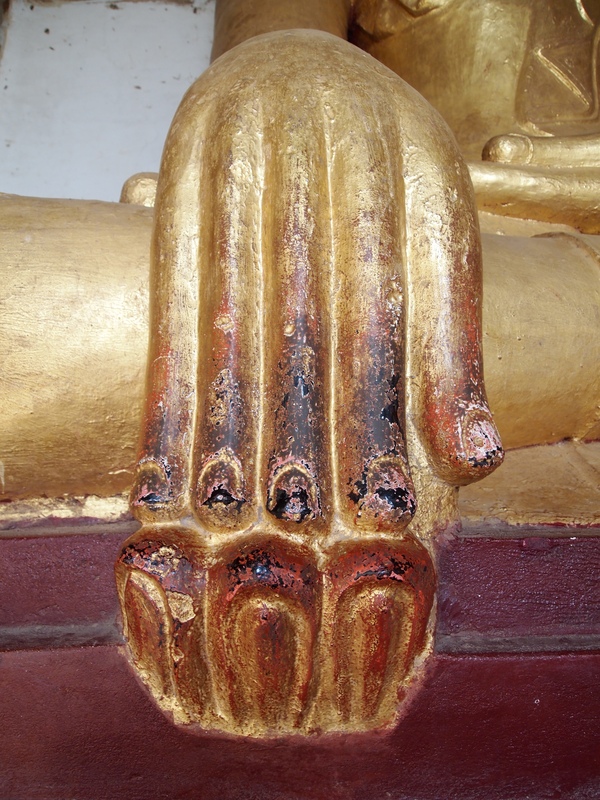 As a reward he was given the hand of the King’s daughter. 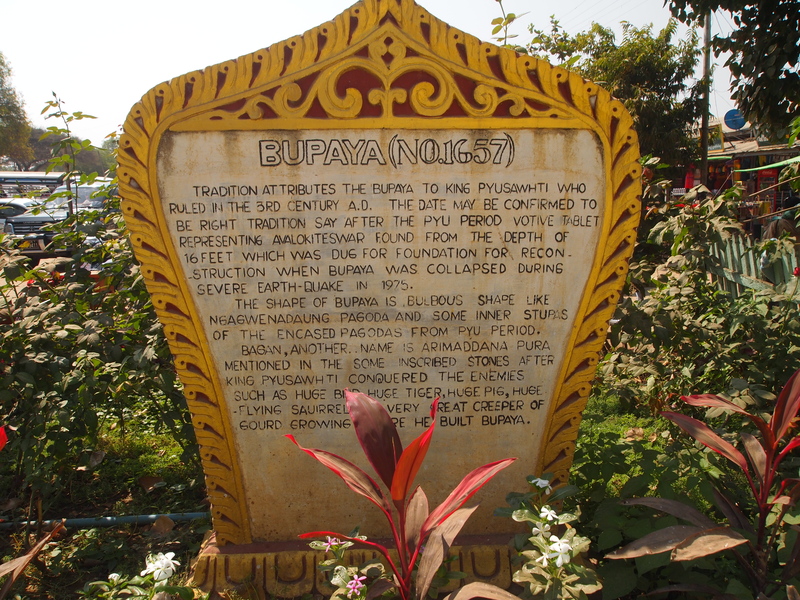 It is said that when he became King, he built the pagoda at the spot where the bu plant was eradicated. 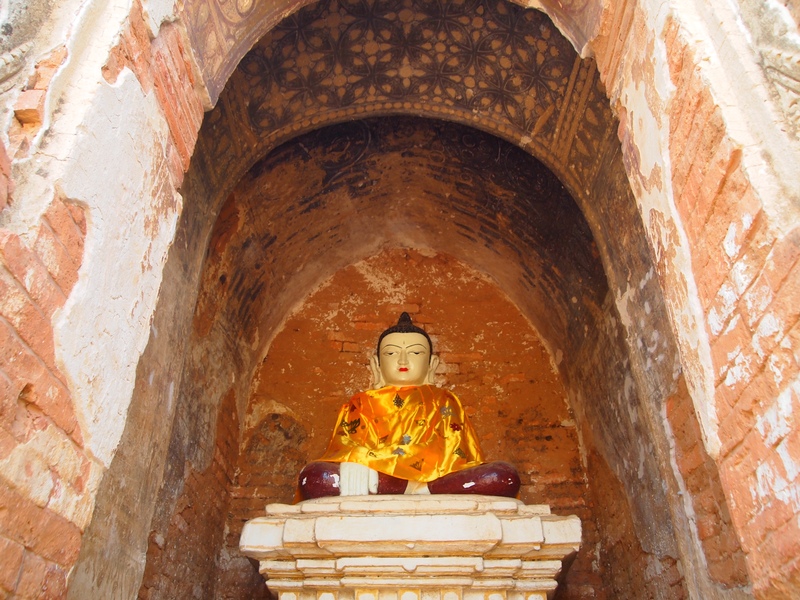 Buddhist relics were enshrined in the pagoda (Renown Travel: Bupaya Pagoda). 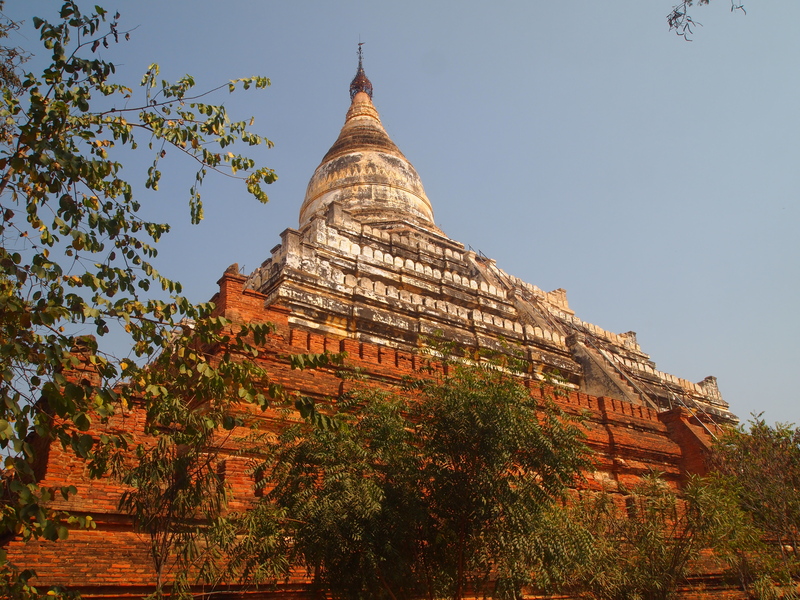 My driver takes me next to Mahabodhi Paya, modeled after the Mahabodhi Temple in Bodhgaya, India, which commemorates the seven sacred places where Buddha attained enlightenment. 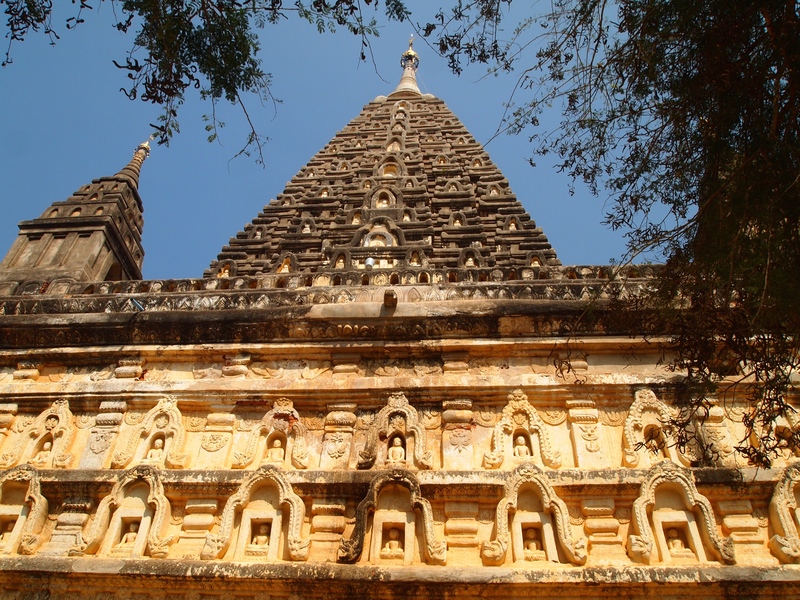 The temple is built in an architectural style typical during the Gupta period, and contains a large pyramidal tower with many niches containing over 450 images of Buddha (Wikipedia: Mahabodhi Temple, Bagan). 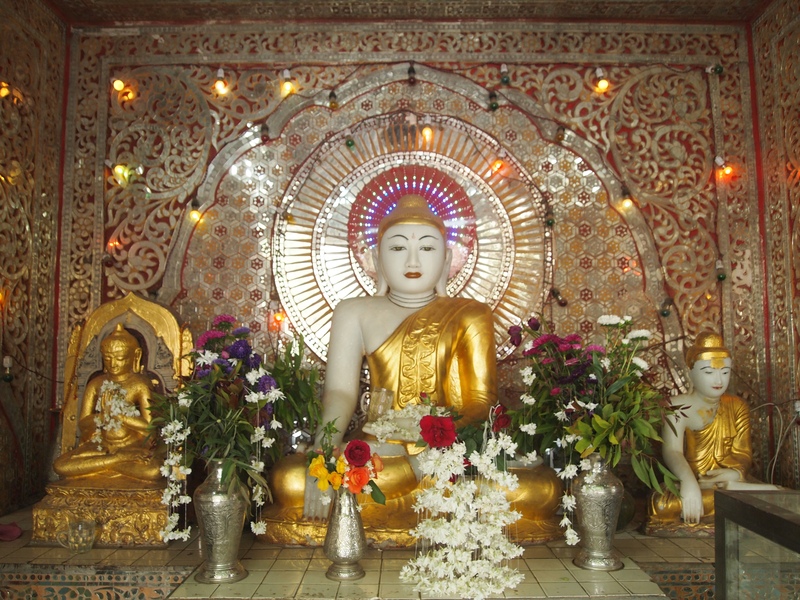 On the ground floor is a Buddha image with the right hand in earth-touching posture (BaganMyanmar.com: Maha Bodhi Temple). 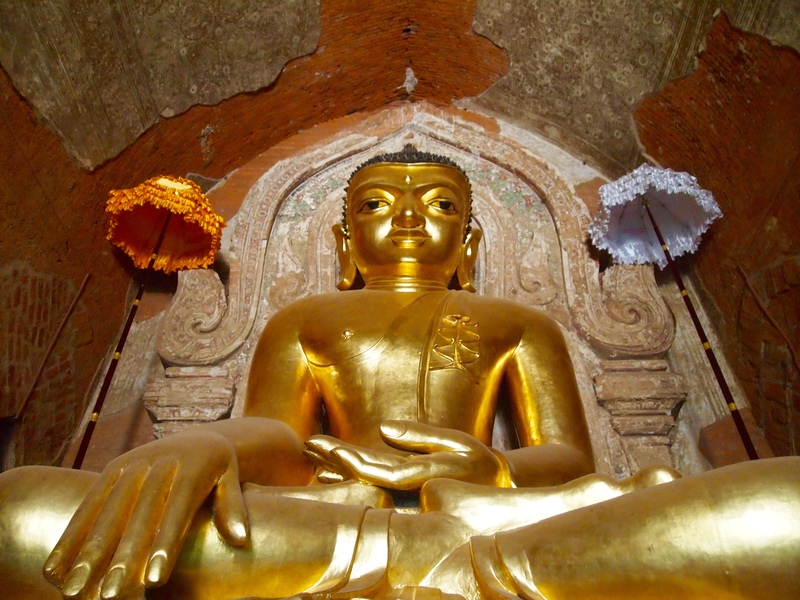 Mahabodhi Paya has hundreds of niches with Buddha statues in different postures – sitting, standing and reclining. 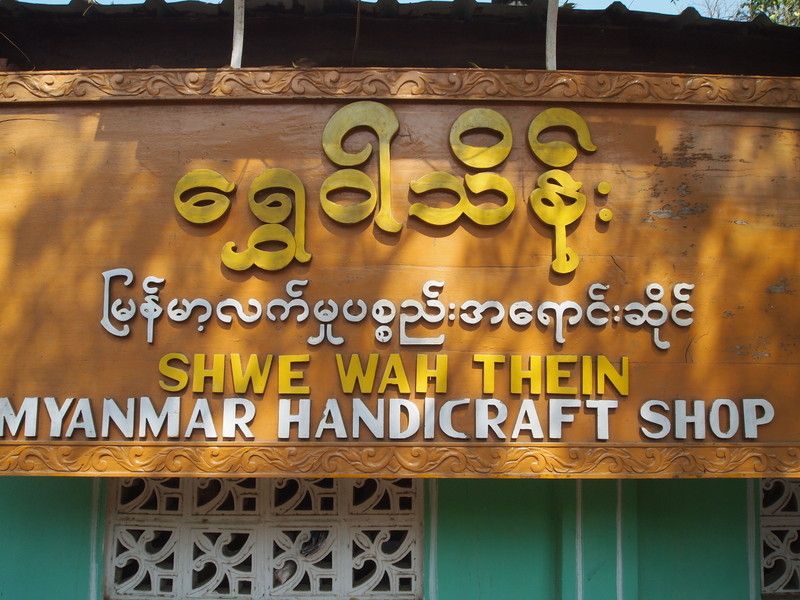 After we leave Mahabodhi Paya, the driver takes me to the Shwe Wah Thein Myanmar Handicraft Shop, telling me it’s a lacquerware workshop. It isn’t a workshop at all but just a shop, so I walk quickly through. 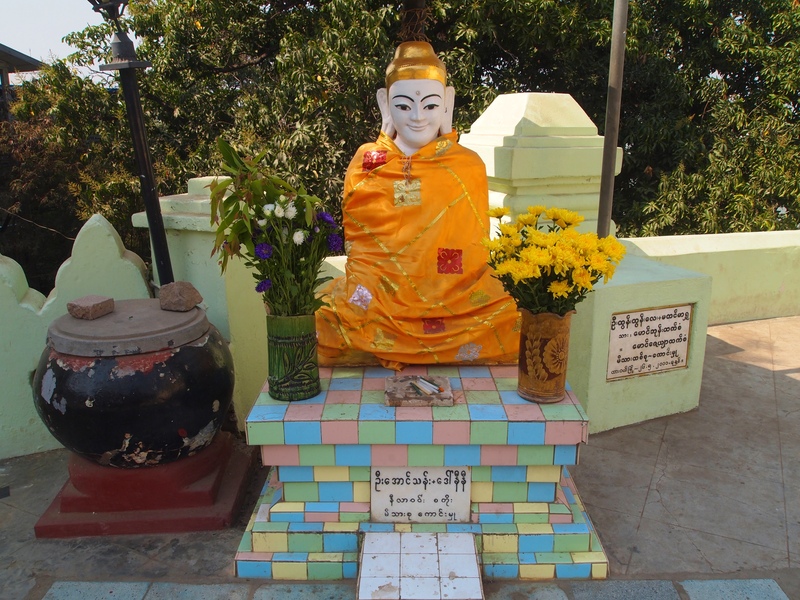 We drive to the North Plain to see Htilominlo Pahto at this time. 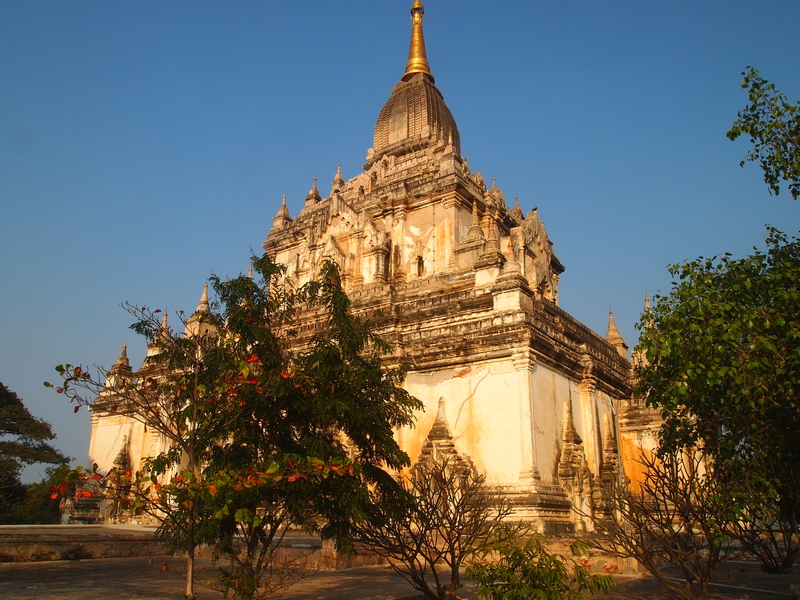 This temple was built around 1211 by King Htilominlo, also known as King Nadaungmya and several other names. 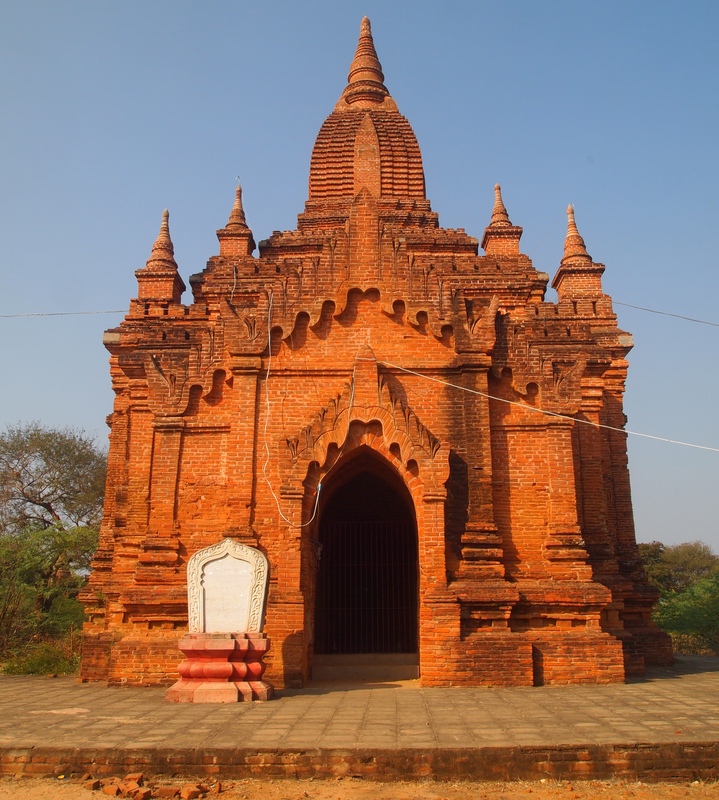 It is made of red brick and stone and stands 150 ft (46 m) high on a low platform. 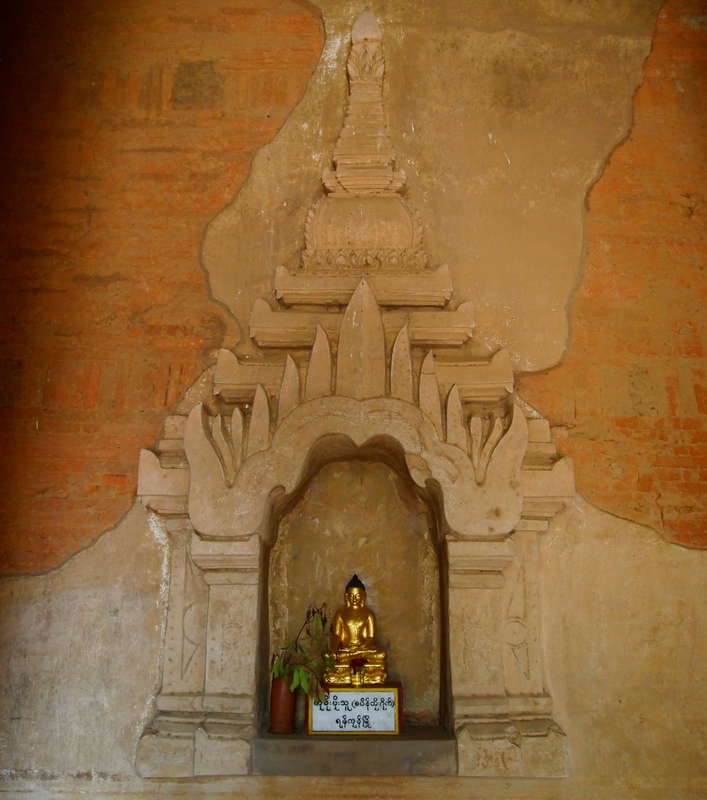 There are four Buddhas images on the ground floor that face the four cardinal directions. 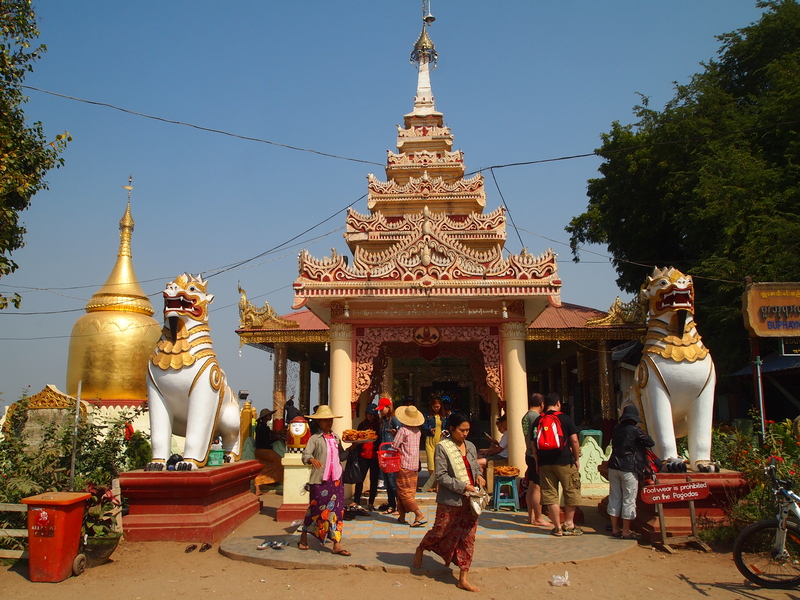 This temple is referred to in Lonely Planet Myanmar as “vendor central” as there are scores of vendors here. I can’t resist buying some things: 3 pairs of cotton printed pants ($3 each!) 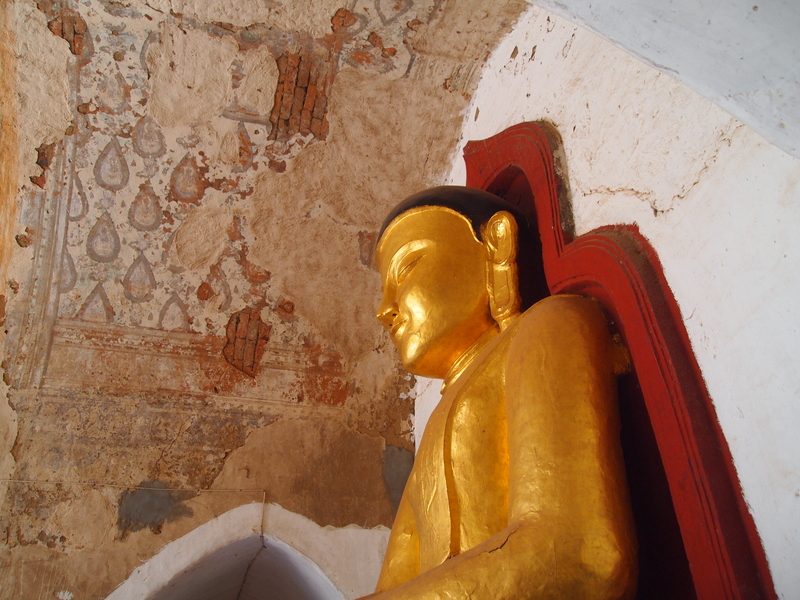 and a life of Buddha fold-out accordion-like pictogram. 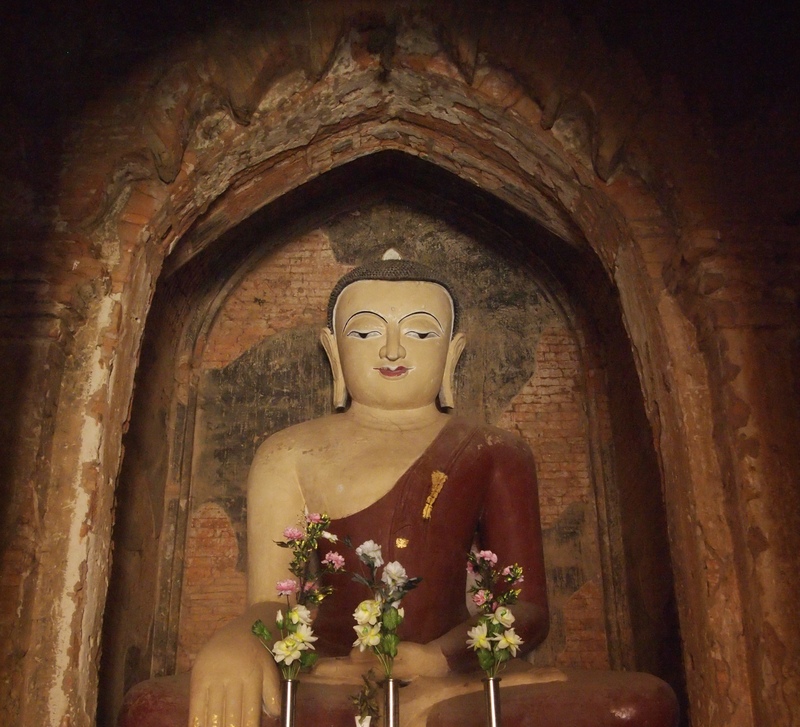 Behind Htilominlo Pahto is a monastery. 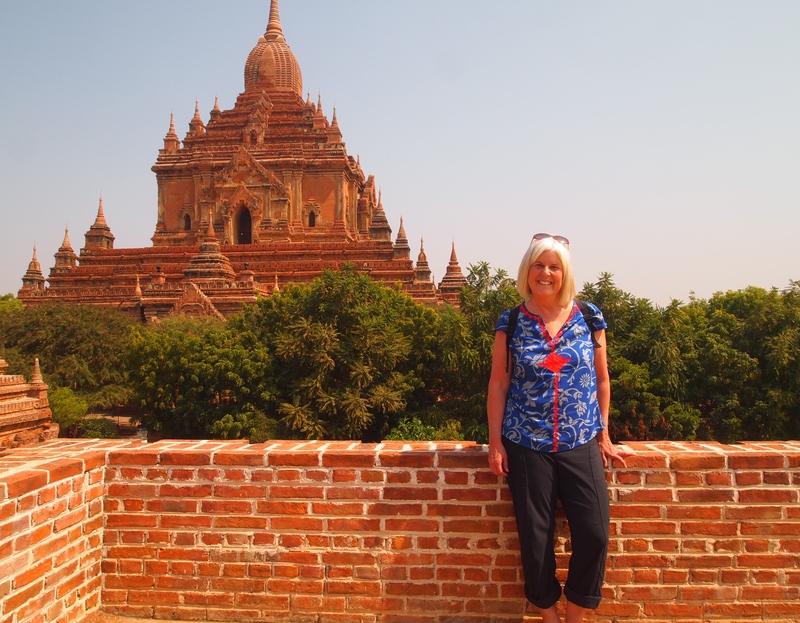 I climb up with some other tourists for a great view of Htilominlo Pahto. 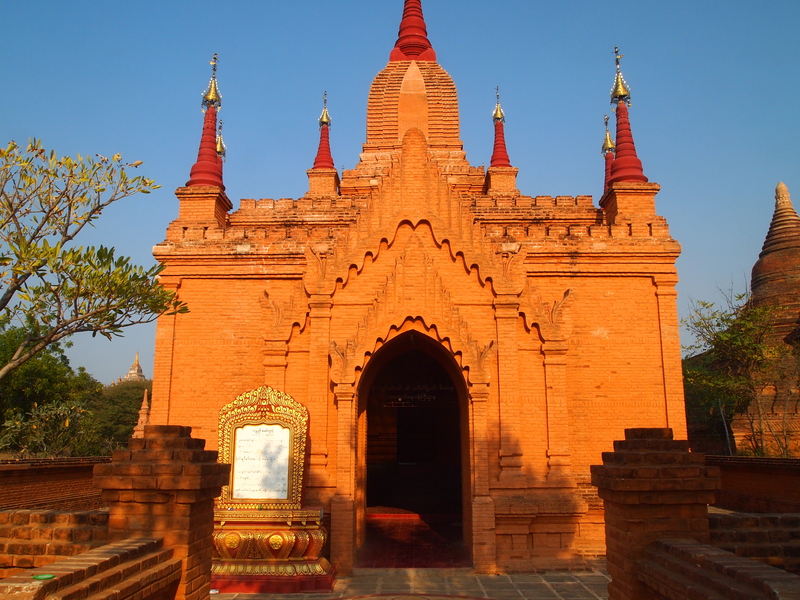 There are also some smaller temples in the North Plain that we can see. 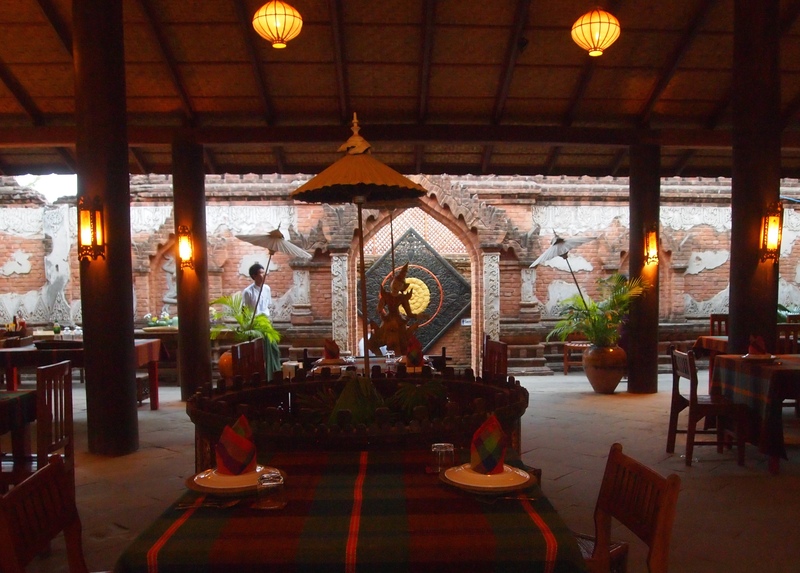 After leaving Htilominlo Pahto, my driver takes me to have some lunch at a lovely open-air restaurant called Sarabha I, where I have a tasty lunch of cauliflower and snow peas. 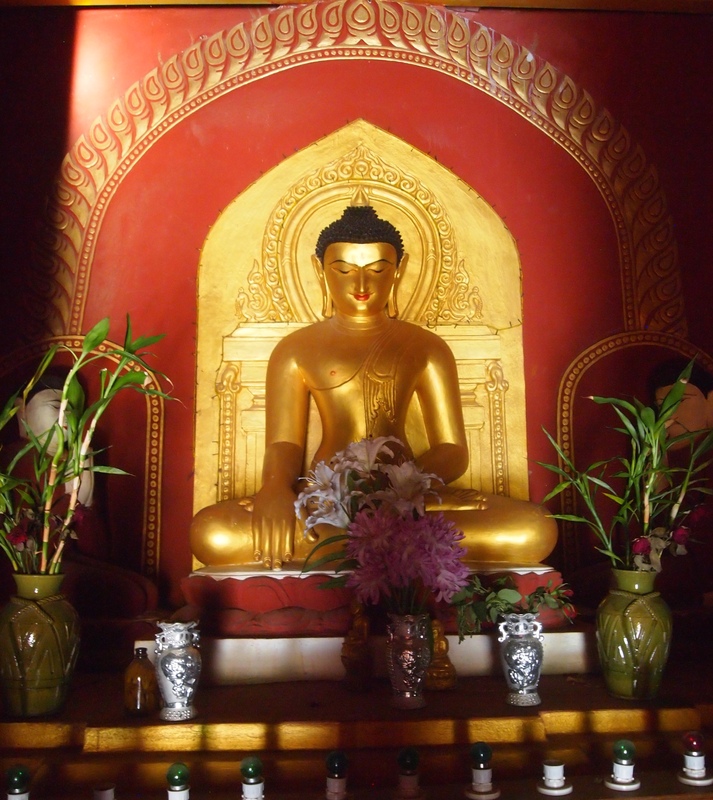 After lunch we continue seeing the sights on the North Plain by heading to Ananda Pahto. 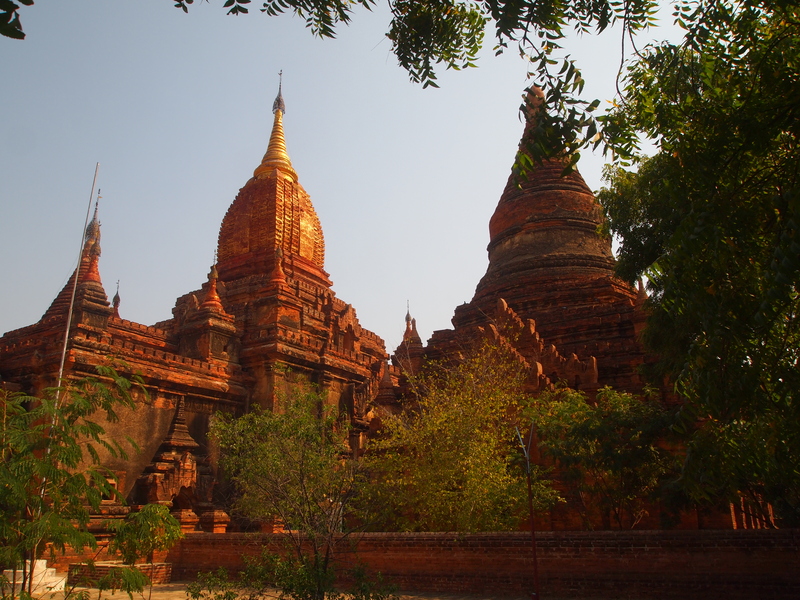 This is the first of the great temples in Bagan, as well as being one of the largest and most beautiful. 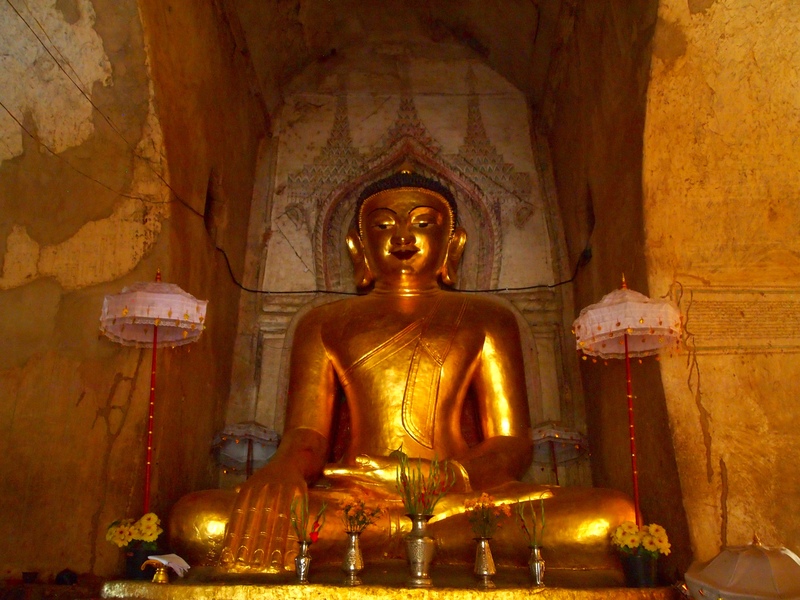 It was built by King Kyanzittha around 1090-1105, after he was inspired by eight visiting Indian monks who told of their lives in the Nanadamula Cave in the Himalayas. 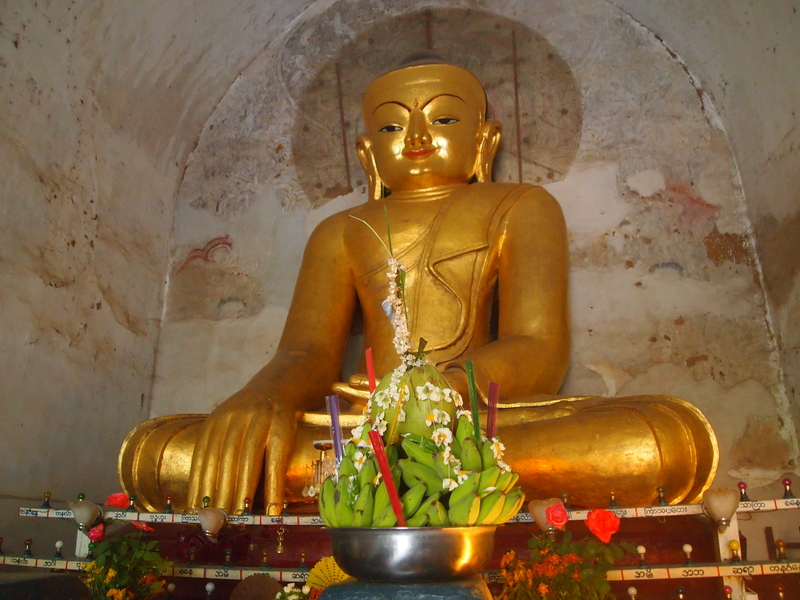 After they described the cave in great detail during a meditative state, they subsequently built the temple. 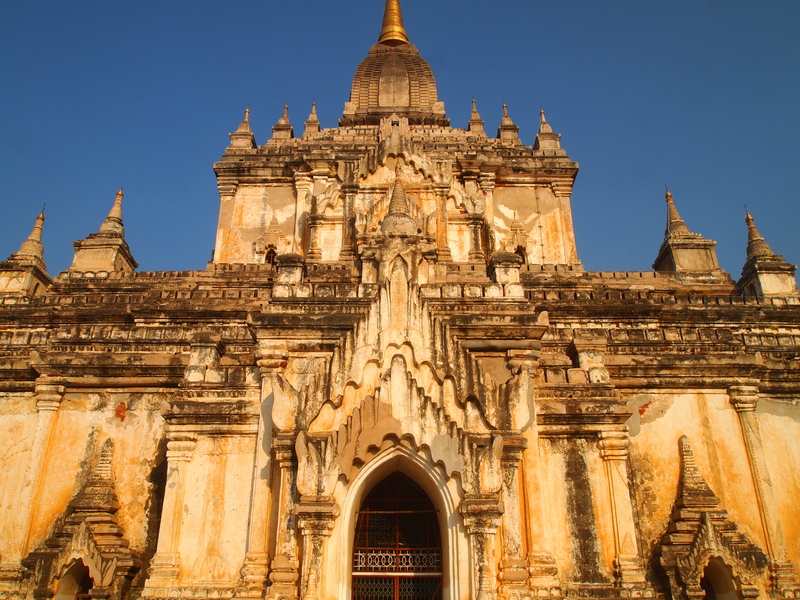 It didn’t end well for the monks, however, as the king executed them so they wouldn’t be able to build another temple like it anywhere. 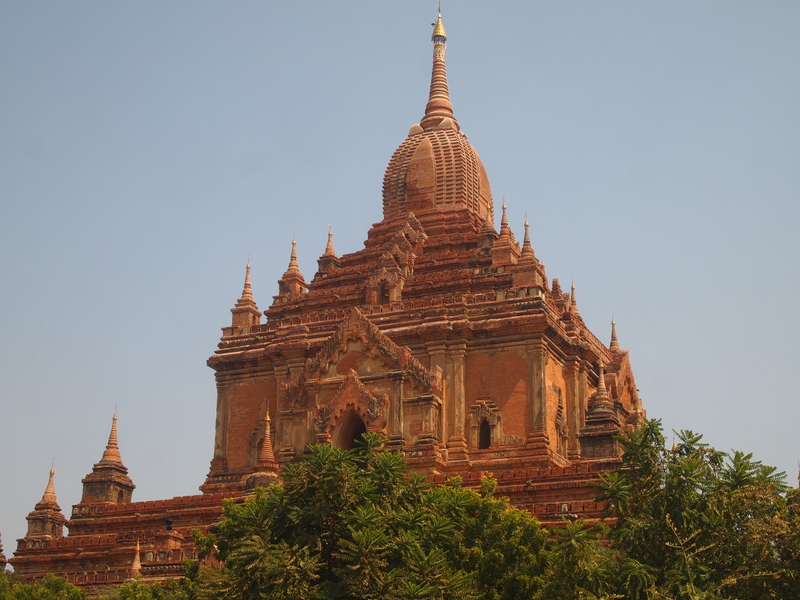 This insured the temple’s uniqueness (Sacred Destinations: Ananda Pahto Temple, Bagan and Wikipedia: Ananda Temple). 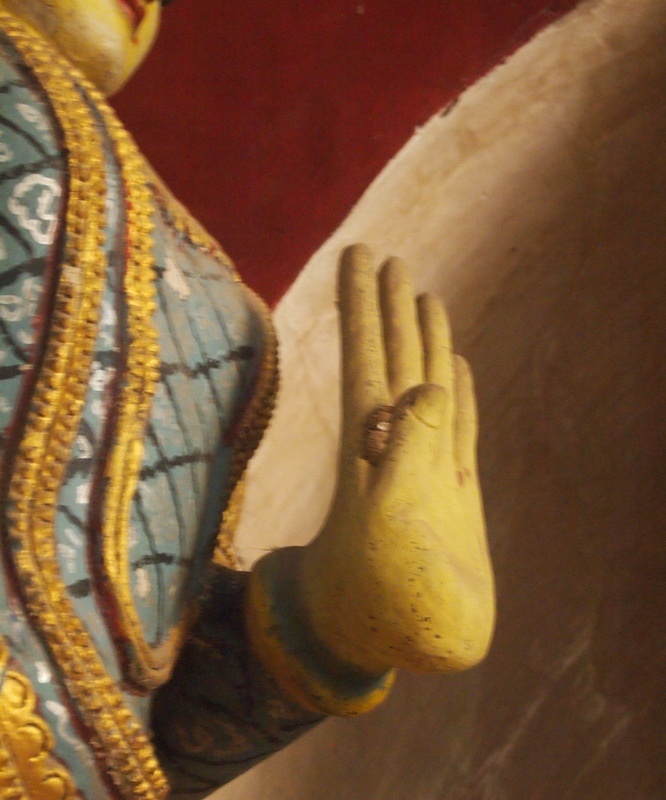 A small nut-like object held in the hand of the east-facing Buddha and in the hand of the figure below is thought to resemble an herbal pill, and may represent the Buddha offering dhamma (Buddhist teachings) as a cure for suffering (Sacred Destinations: Ananda Pahto Temple, Bagan and Lonely Planet Myanmar: Ananda Pahto). 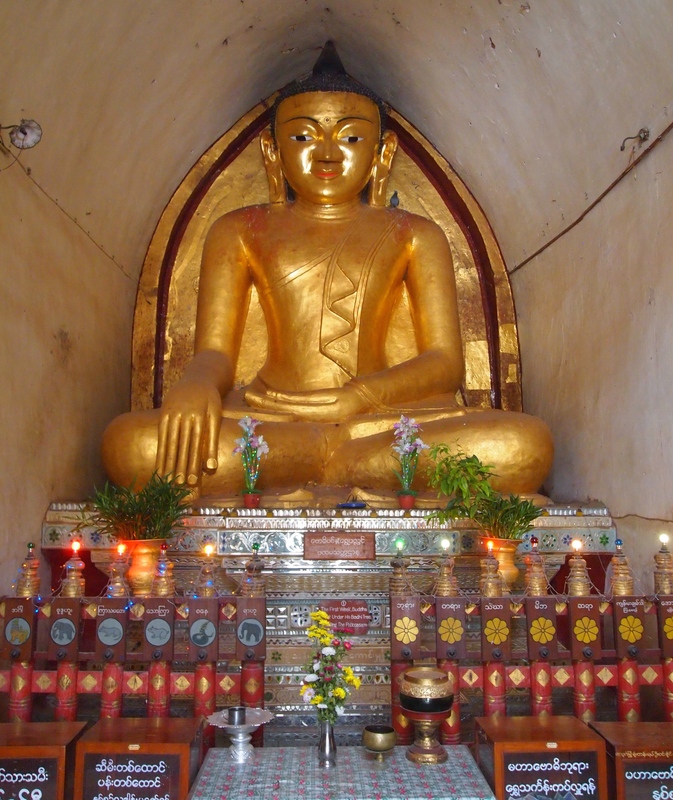 Four impressive 30-foot-tall gilded teak standing Buddhas, facing the four cardinal directions, represent the four Buddhas who have attained enlightenment in the current world cycle. 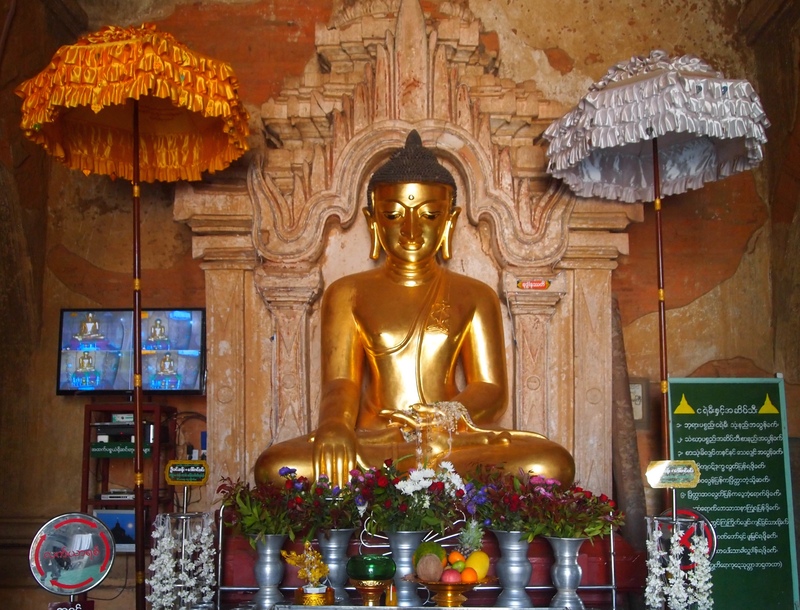 The main purpose of the temple was to educate the people of the region in the religious beliefs of Theravada Buddhism in accordance with the personal beliefs of King Kyanzittha (Wikipedia: Ananda Temple). 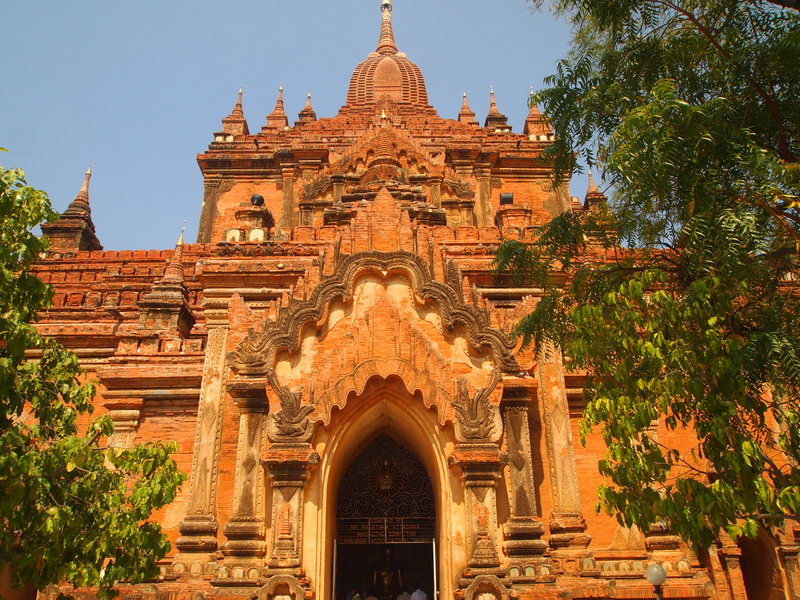 Ananda Pahto is designed on a symmetrical Greek Cross plan (+). 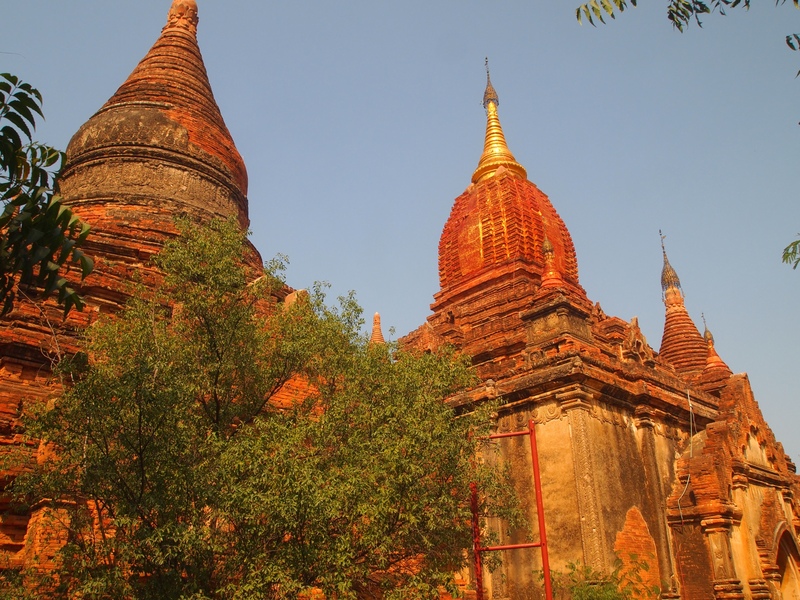 Several terraces lead to a small pagoda at the top covered by an umbrella known as hti, which is the name of the umbrella or top ornament found in almost all pagodas in Myanmar (Wikipedia: Ananda Temple). 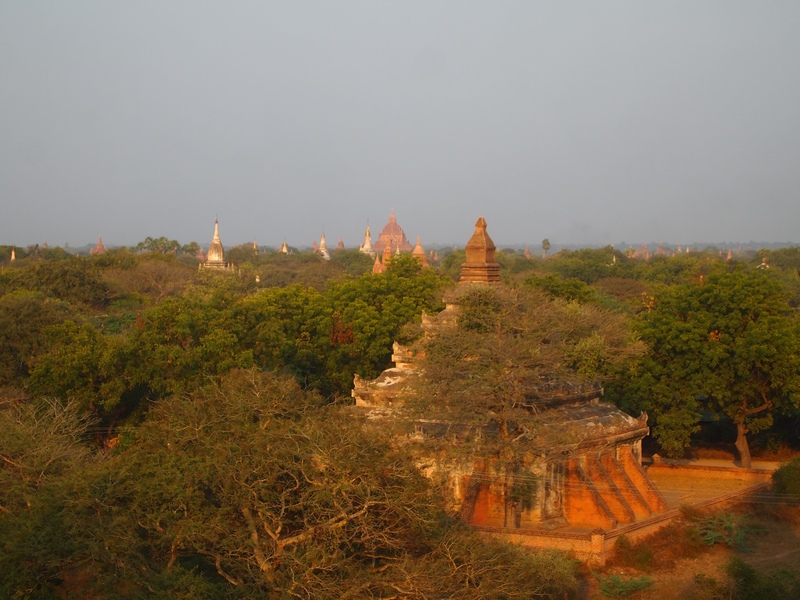 Finally, we leave the North Plain and drive back to Old Bagan to see Thatbyinnyu Pahto, Bagan’s highest temple, at 61 meters in height. 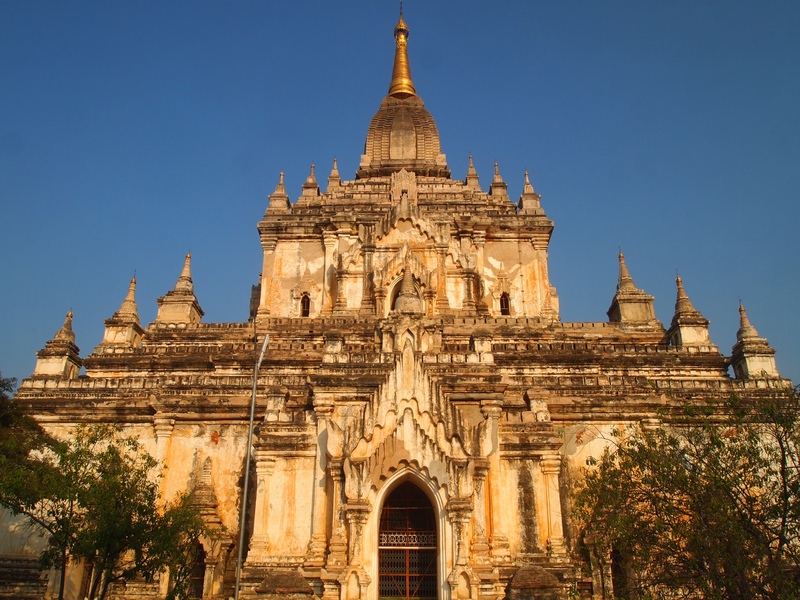 It was built in the mid-12th century during the reign of King Alaungsithu. 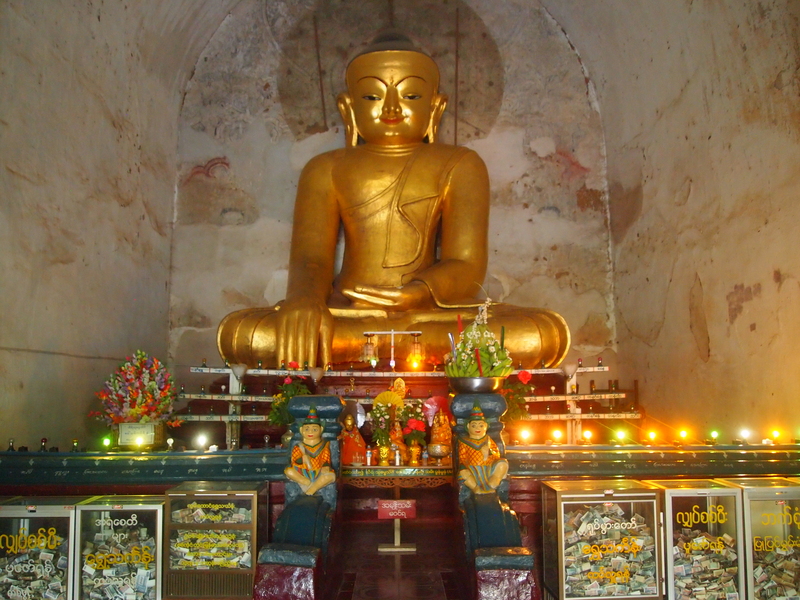 It is adjacent to Ananda Pahto. 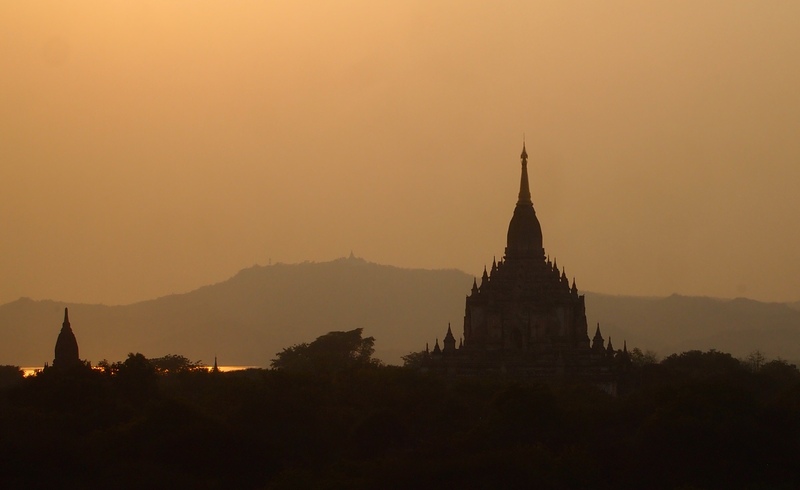 Thatbyinnyu Temple is shaped like a cross, but it isn’t symmetrical. 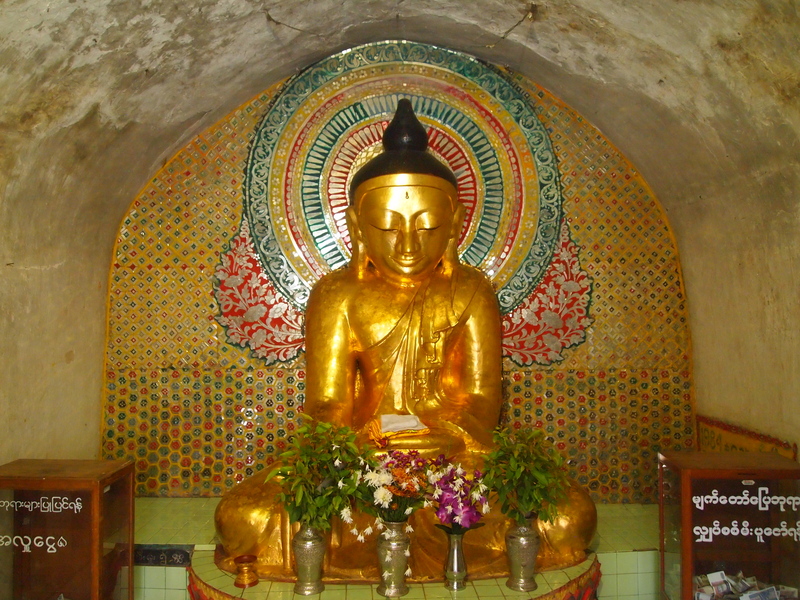 The temple has two primary stories, with the seated Buddha image located on the second story (Wikipedia: Thatbyinnyu Temple). 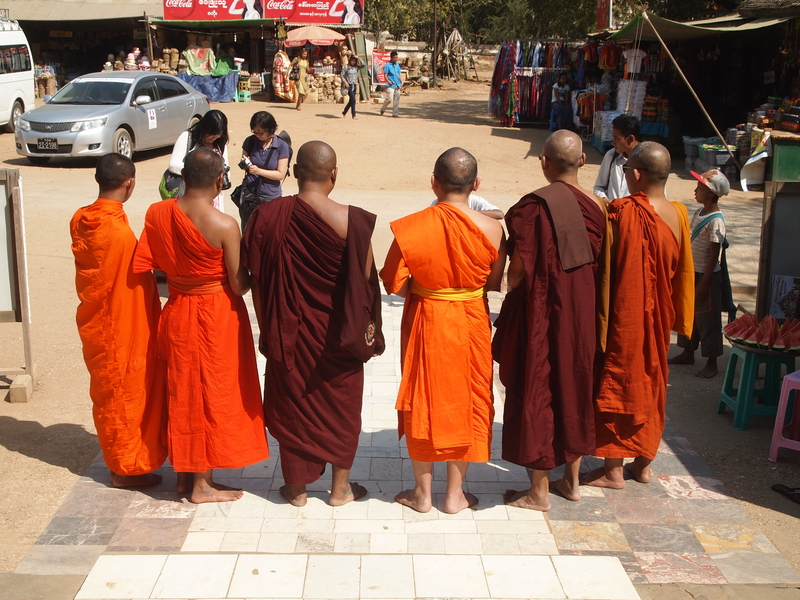 I come upon a group of monks posing for a picture and I sneak a shot from the back. 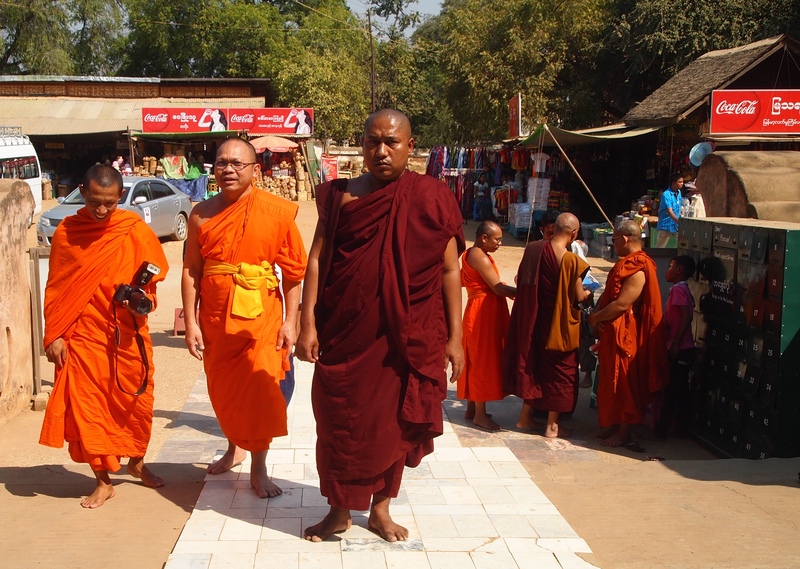 When they disperse, I capture a couple of them walking into the temple. 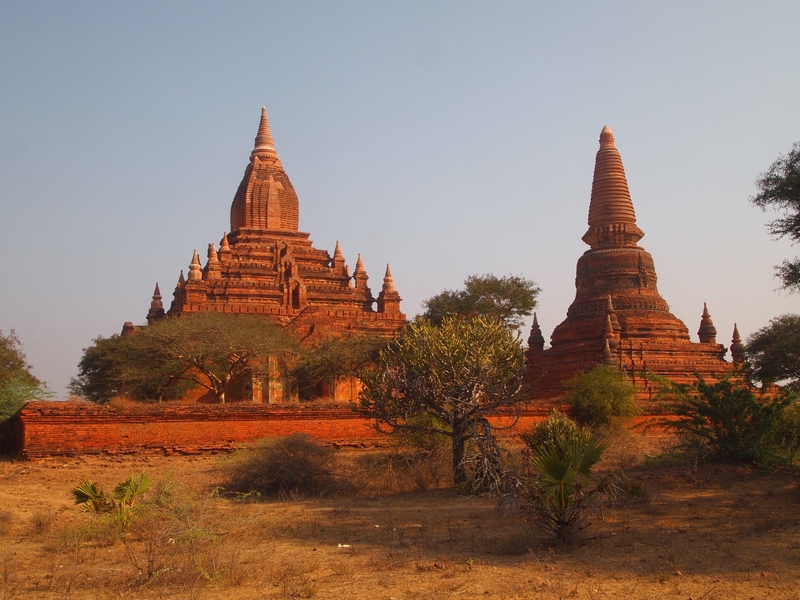 Finally, we leave Old Bagan and head to the Central and South Plain.